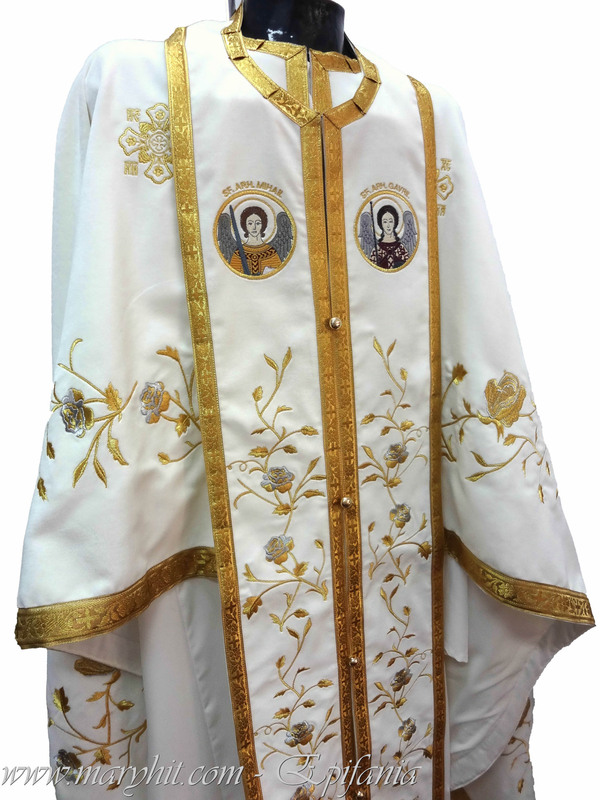 VP110 - white velvet robe embroidered with roses uninterrupted prayers . 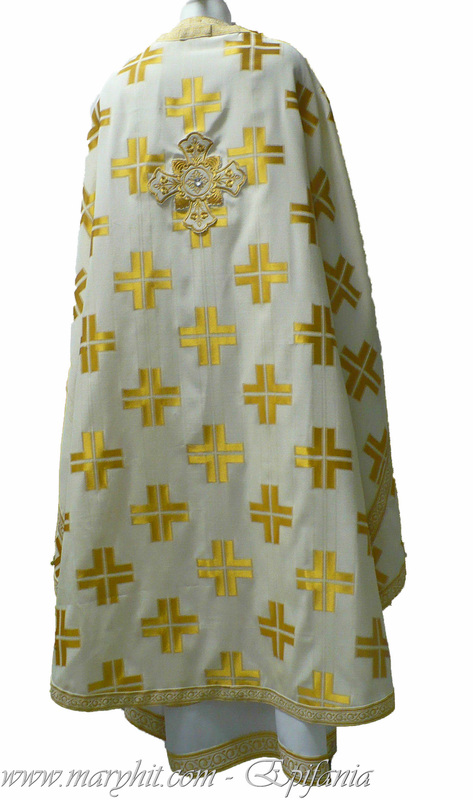 Denotes a great beauty , especially for Easter. 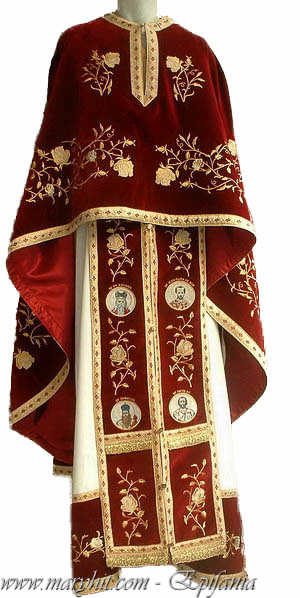 Saints medallions epitrachelion choice . 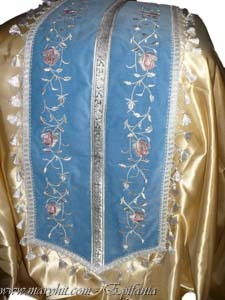 VP111 - white velvet robe embroidered with roses uninterrupted prayers . 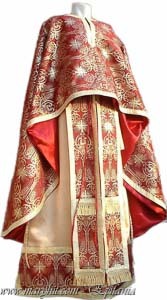 Denotes a great beauty , especially for Easter. 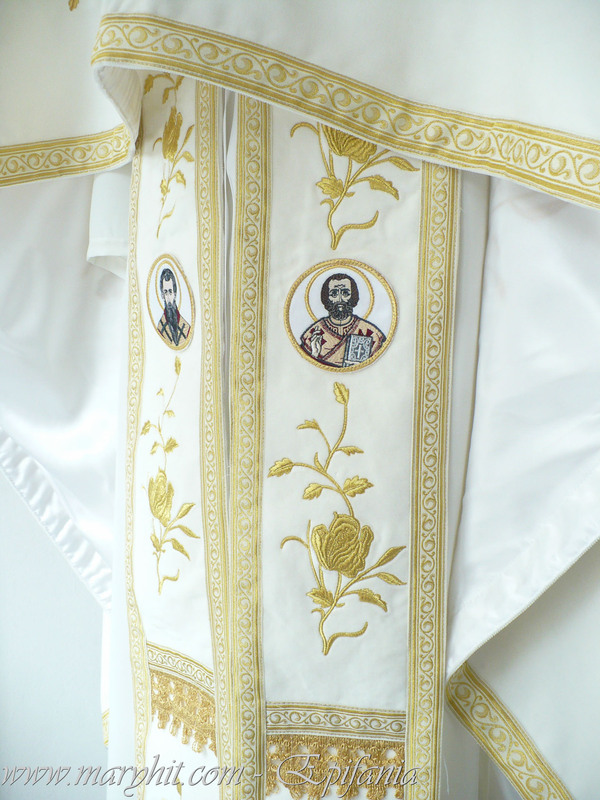 Saints medallions epitrachelion choice . 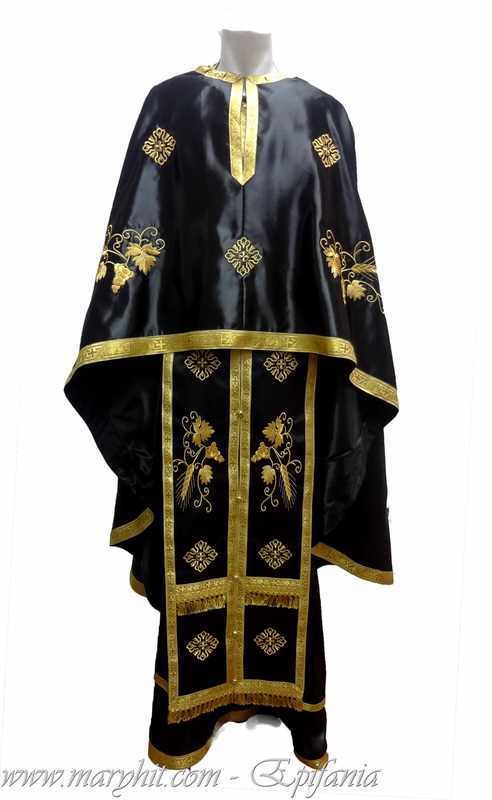 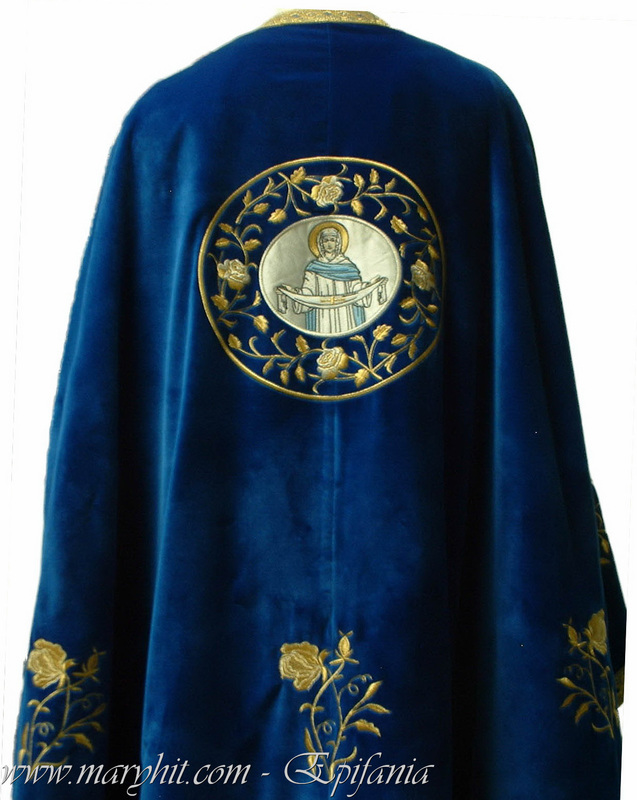 VP112 - velvet robe embroidered with roses prayers . 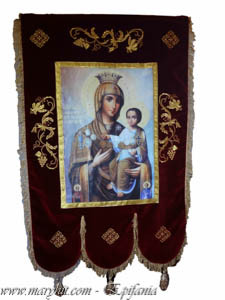 Denotes a great beauty, especially worshiped Virgin Mary with her icon back . 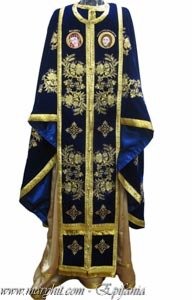 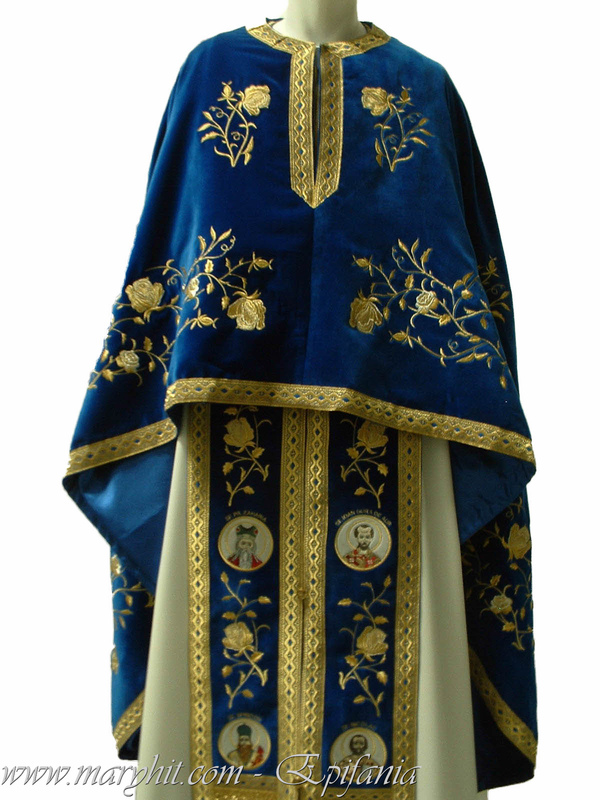 VP113 - blue velvet robe embroidered with roses uninterrupted prayers . Denotes a great beautifulembroidery high quality . VP215 - This exquisite embroidery is Jesus Christ and the 12 apostles . 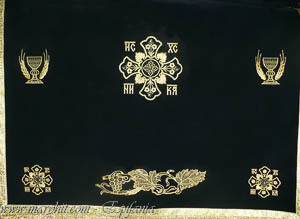 Down snails or other embroidery pattern. 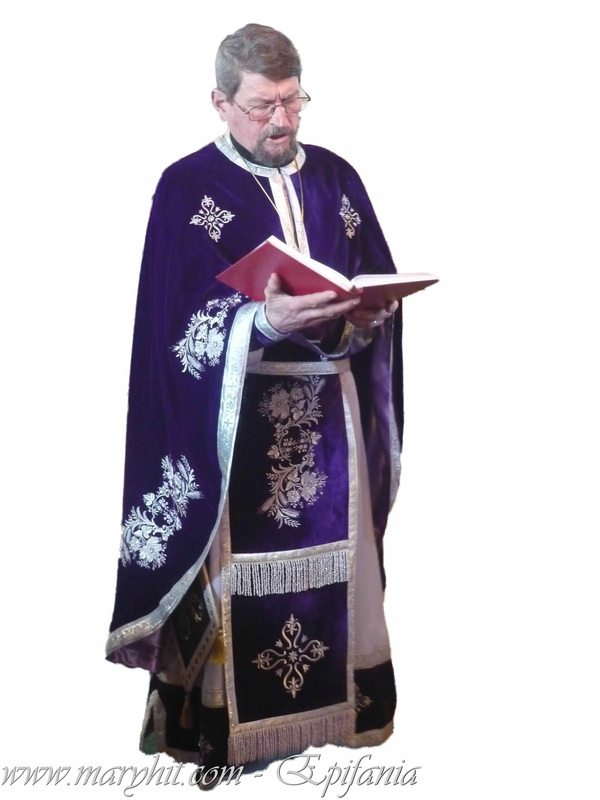 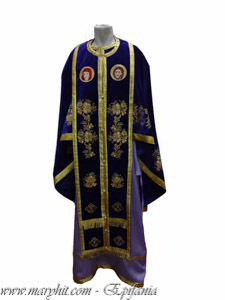 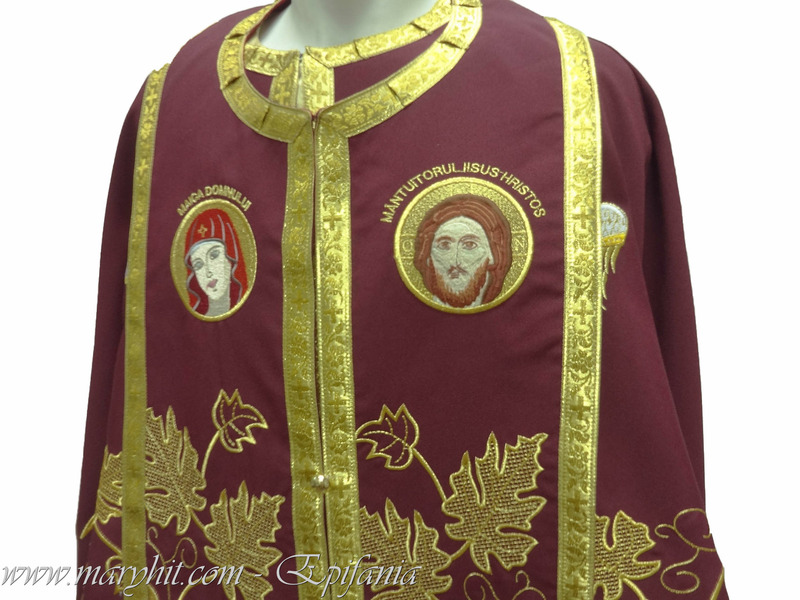 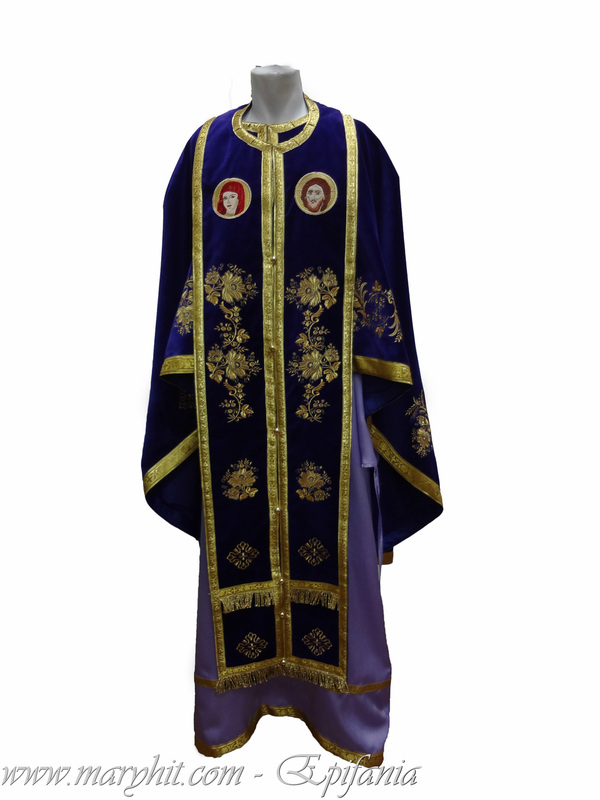 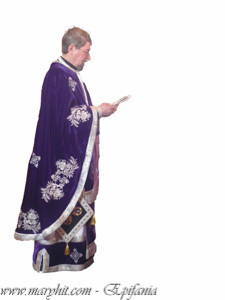 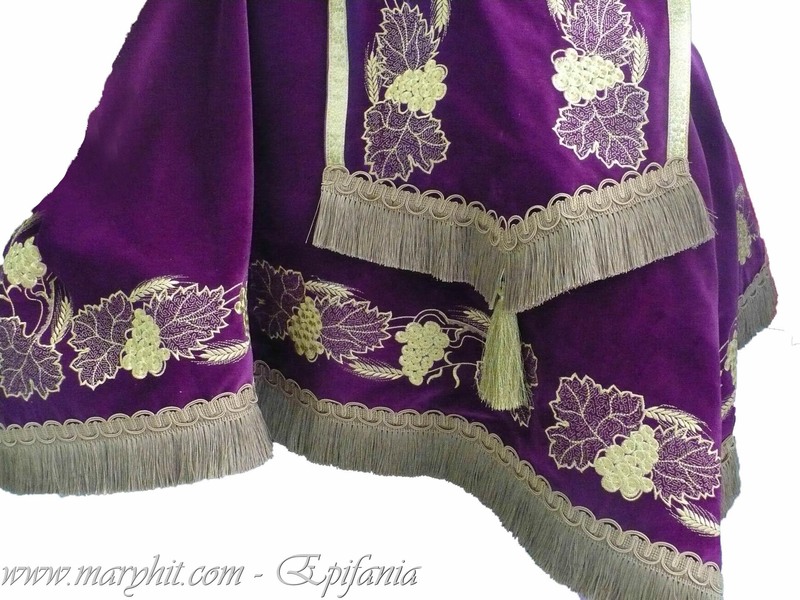 VP300 - priestly vestment purple velvet embroidered with floral and spice . 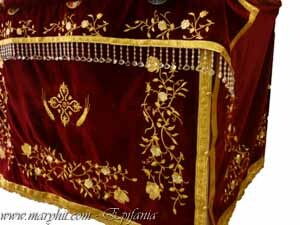 The details of this embroidery give it value . 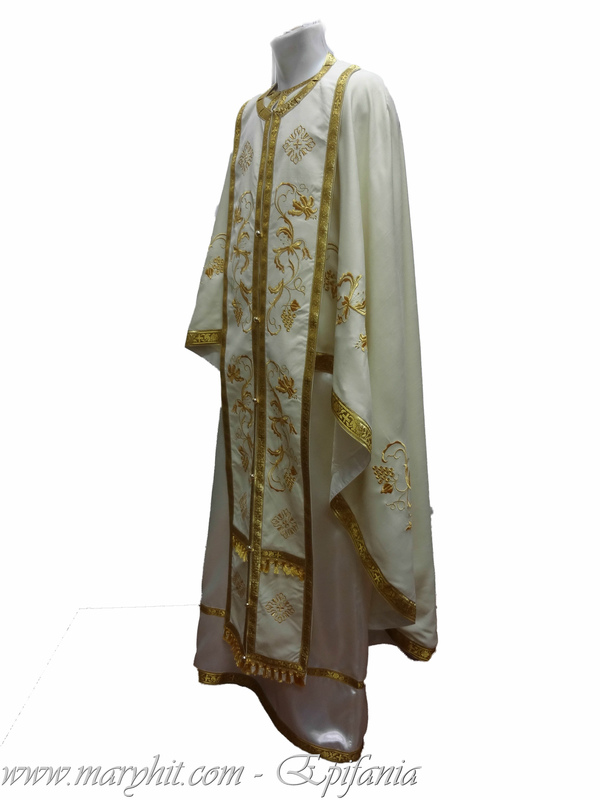 VP301 - long white robe with golden embroidery flower ice. 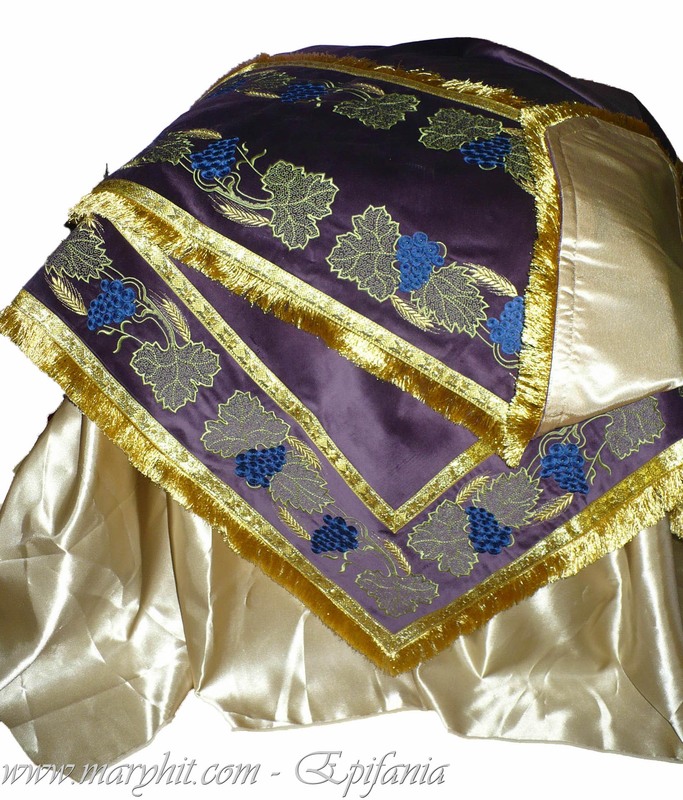 Material with beautiful hair , non-crease . 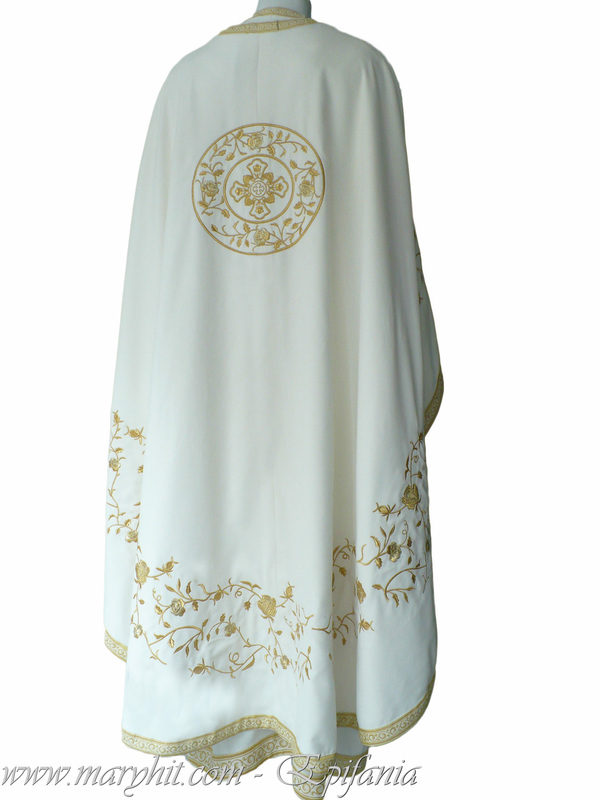 VP317 - embroidery flower is rich in details, can also be golden . 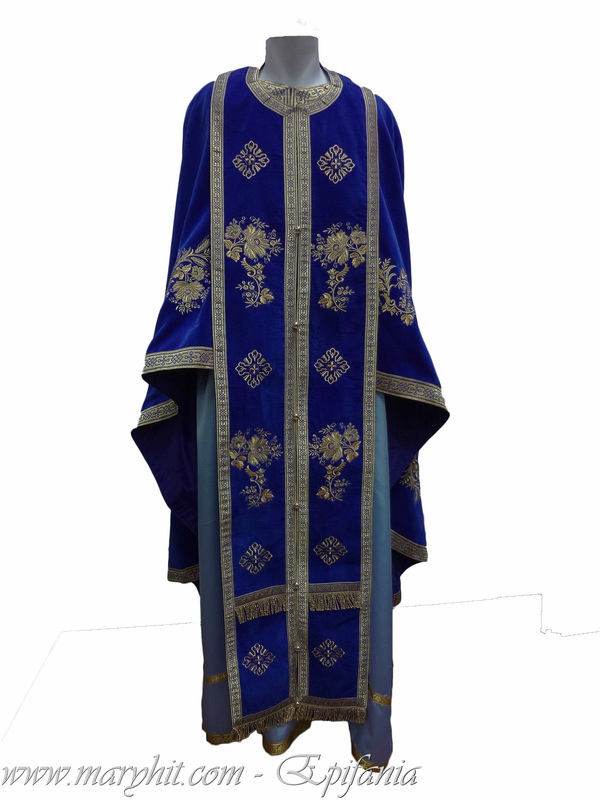 VP330 - blue velvet robe embroidered flowers ice differ in details. 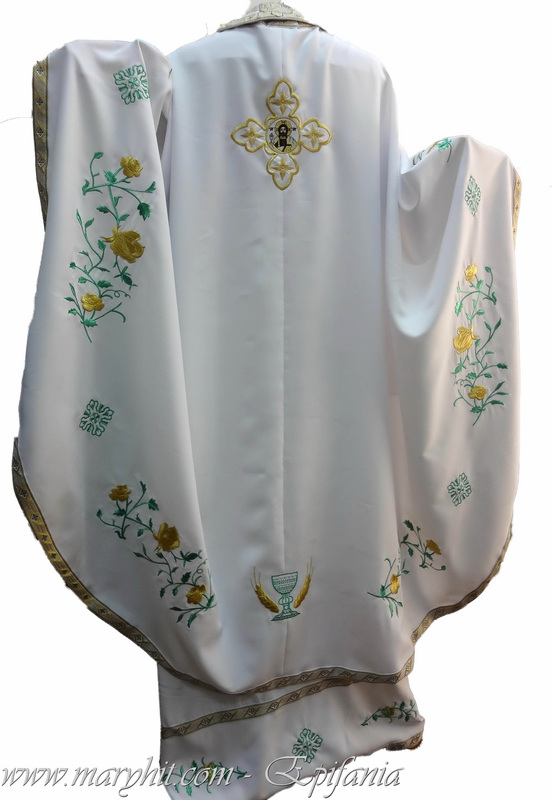 VP333 - Model garment embroidery flower ice goblet , Alpha and Omega emblem . 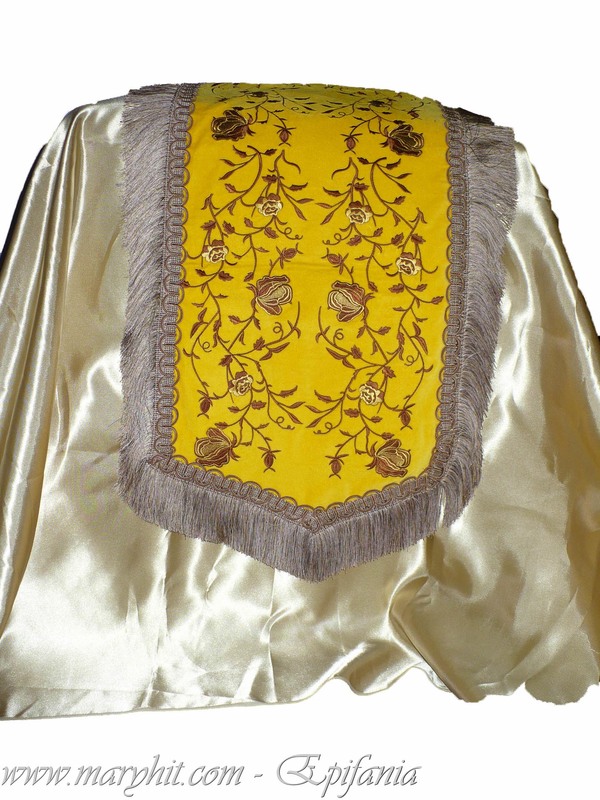 Done Silk . 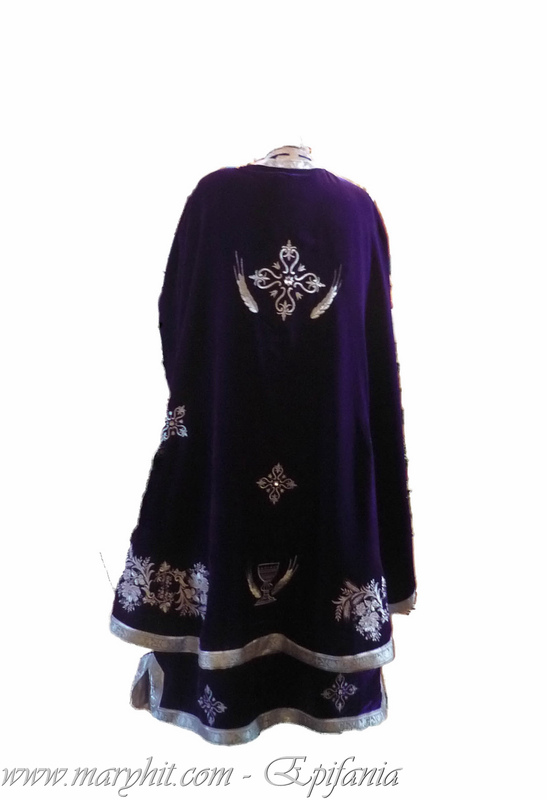 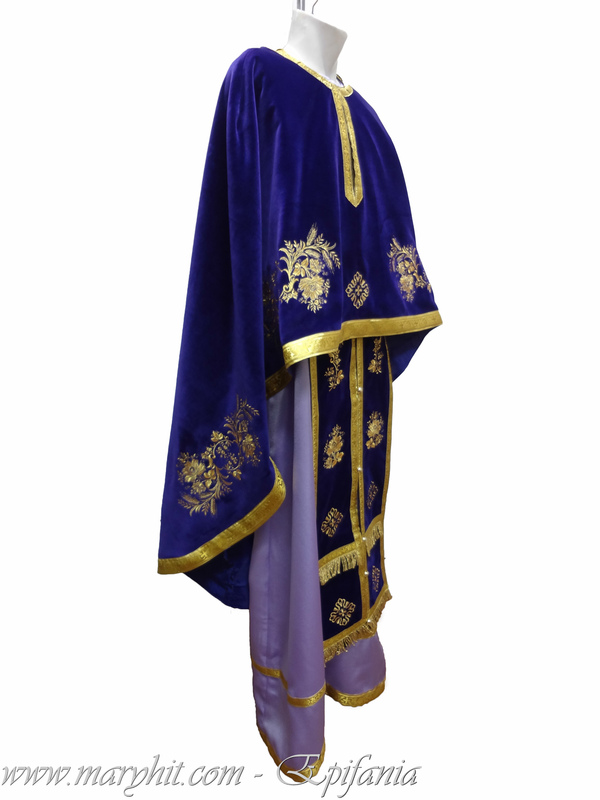 VP370 - purple velvet robe embroidered with purple flowers Detailed gheataembroidery . 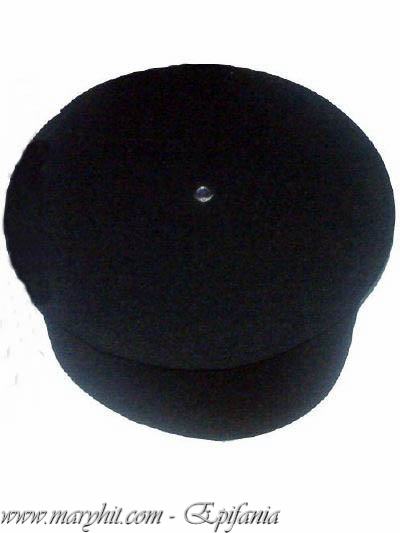 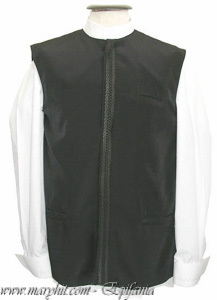 VP440 - garment embroidered with groups of grapes and ears , minimum material , non-crease , easy . 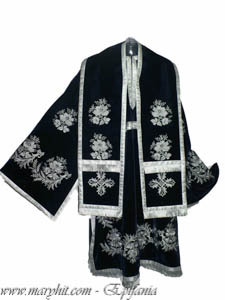 VP460 - black garb and stations during funerals. 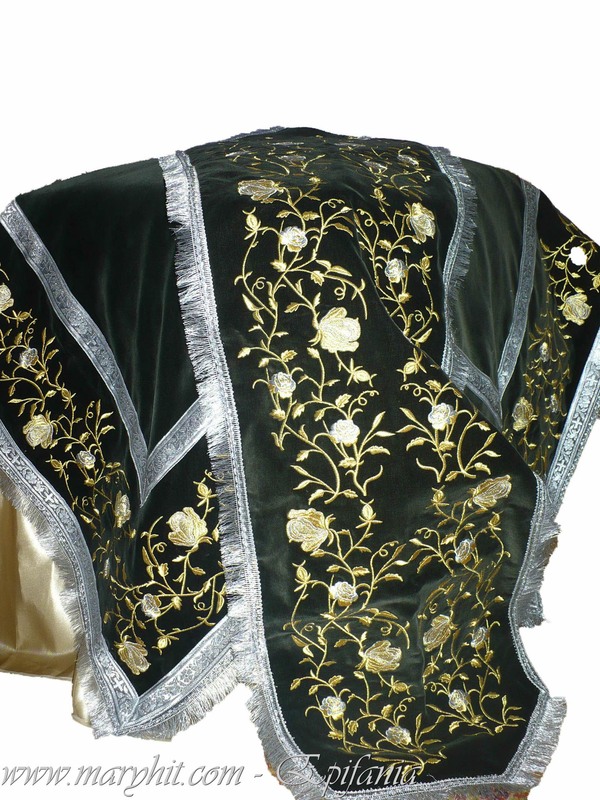 Material taffeta easy . 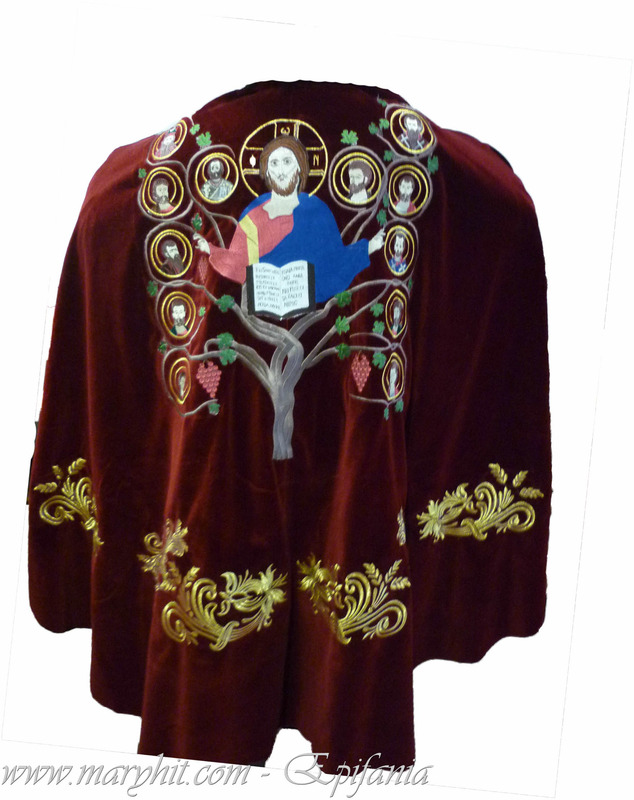 VP510 - velvet robe embroidered with groups of flowers with grapes. 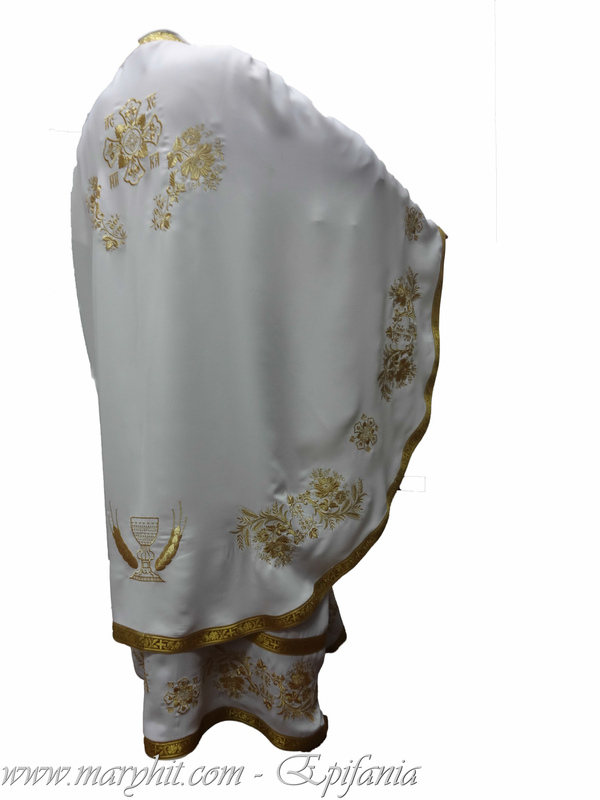 VP513 - garment embroidery silver lilies and grapes , produced in minimal light, promotional nesifonabil.Pret . 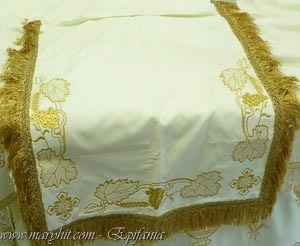 VP514 - very lightweight garment , embroidery groups of lilies with grapes. 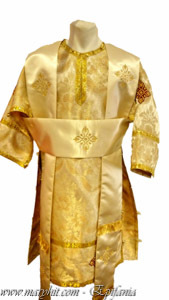 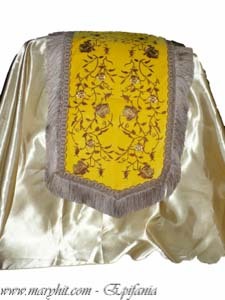 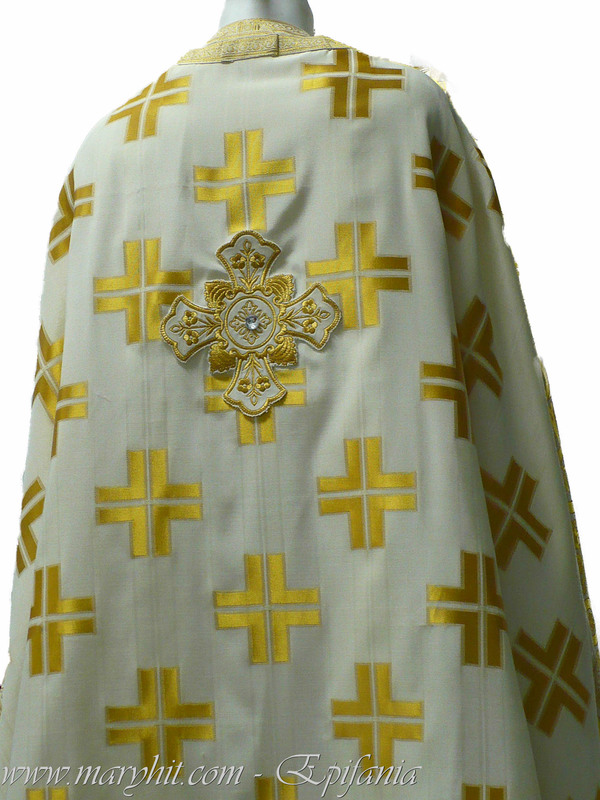 VP700 - yellow brocade robe with crosses aurii.Material resistant . 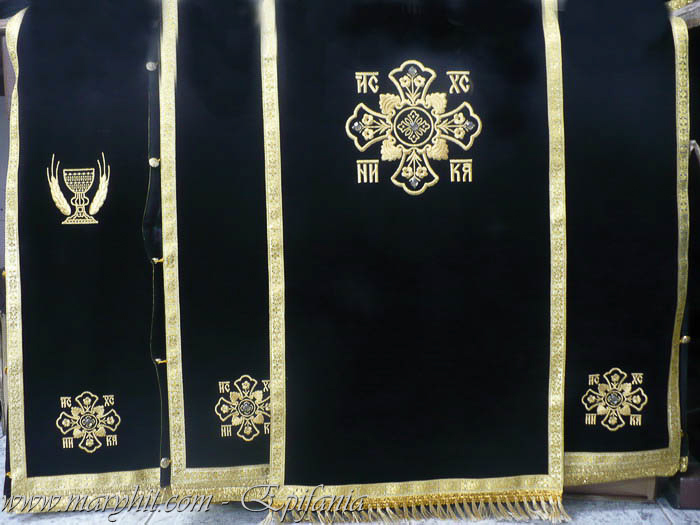 Cross embroidered applied. 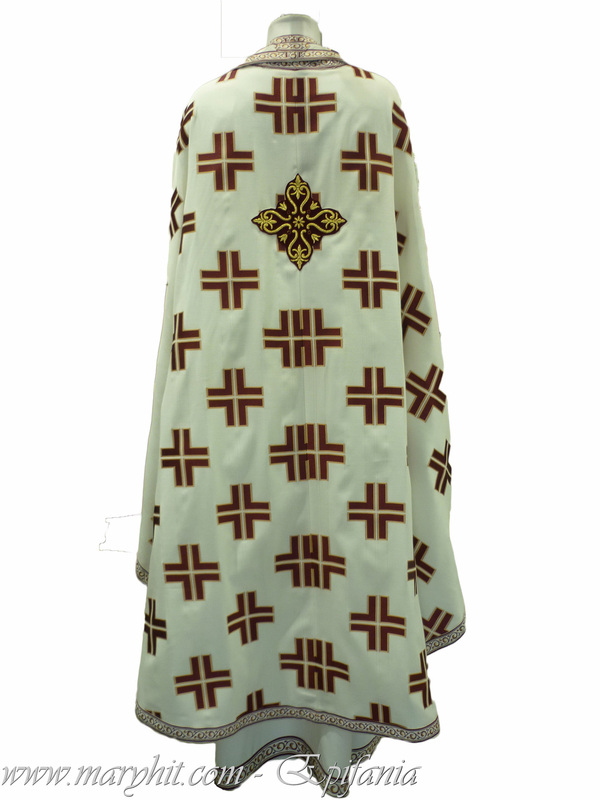 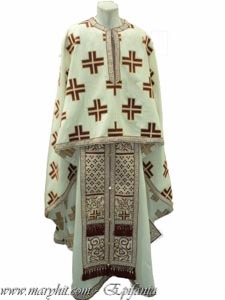 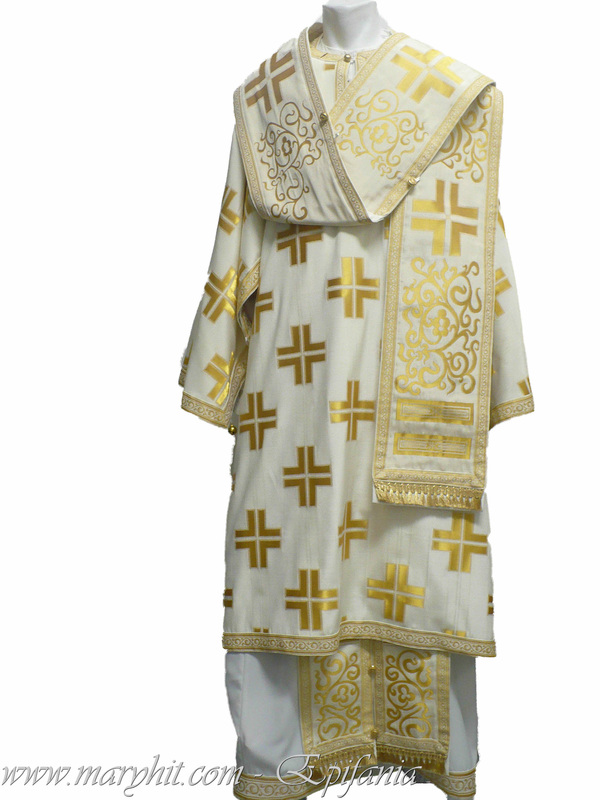 VP701 - white brocade robe with embroidered cross pattern crosses back aurii.Pe . 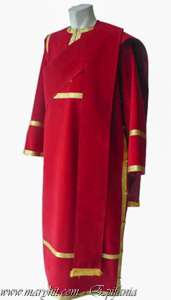 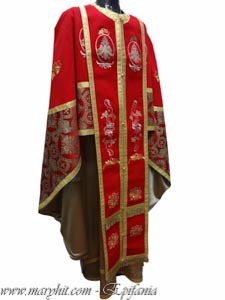 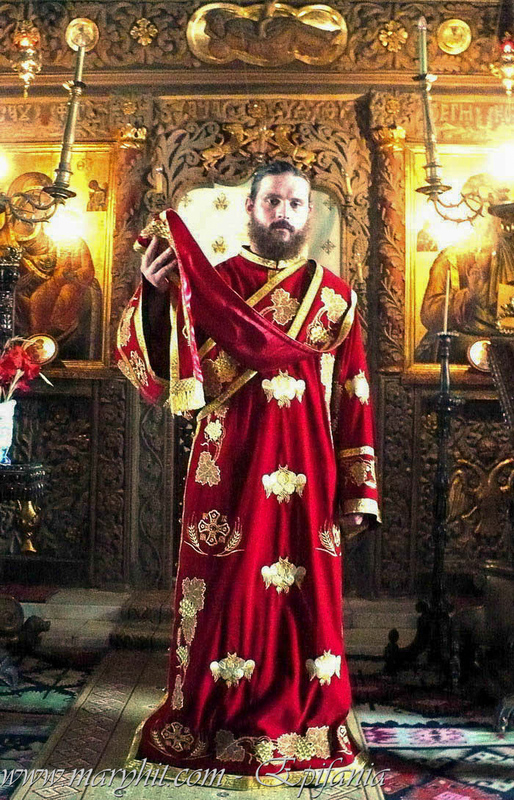 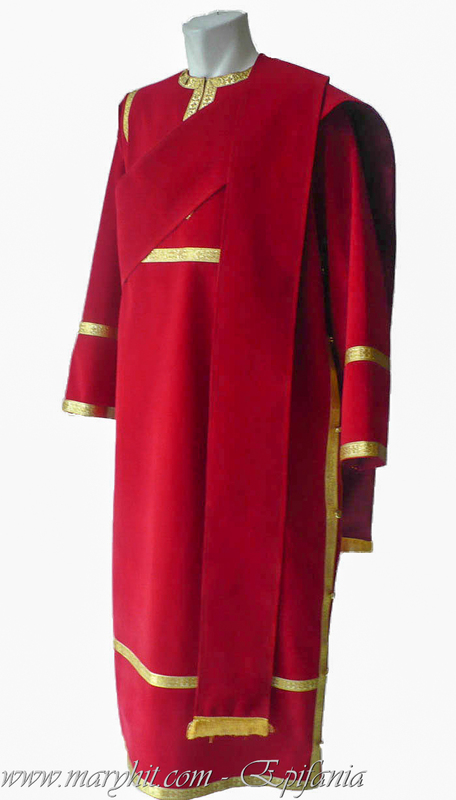 VP702 - red brocade robe with cross pattern with golden ears . 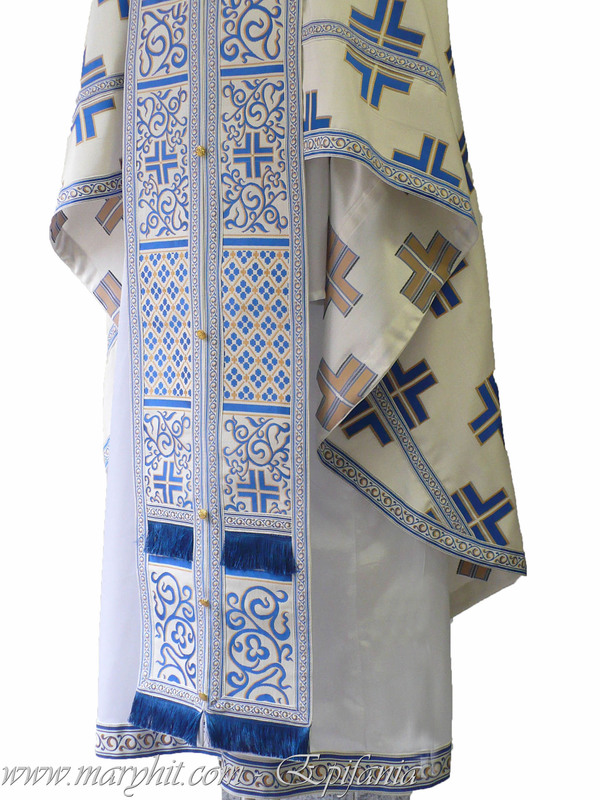 VP800 - garment woven with gold crosses , Grecesc.Foarte quality. 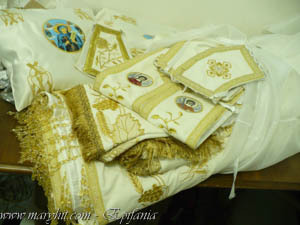 All items assorted . VP801 - Greek garb tissue with crosses visinii.Material high quality silk and lana.Apreciat and warm weather . 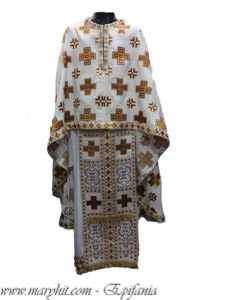 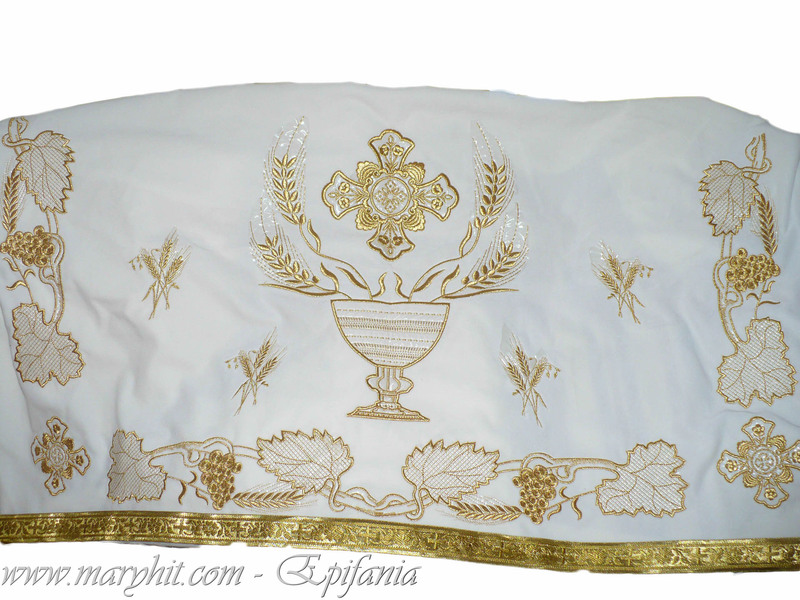 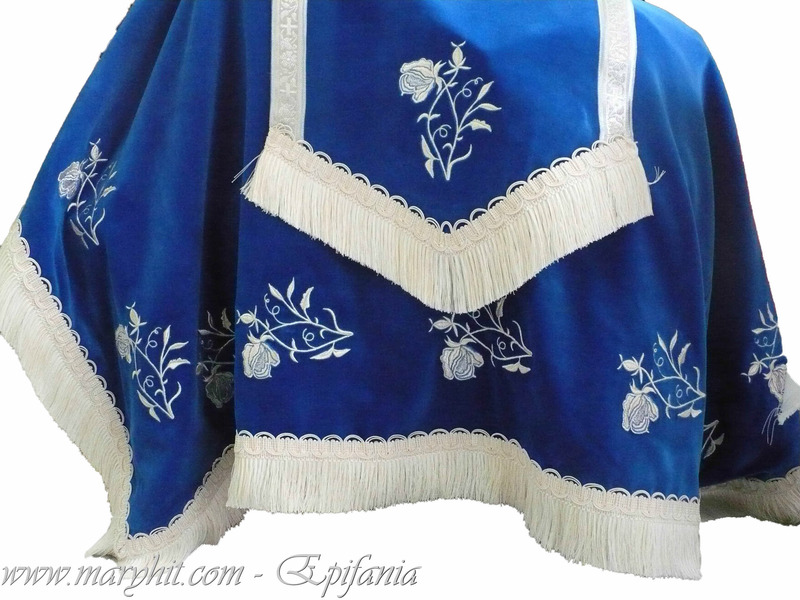 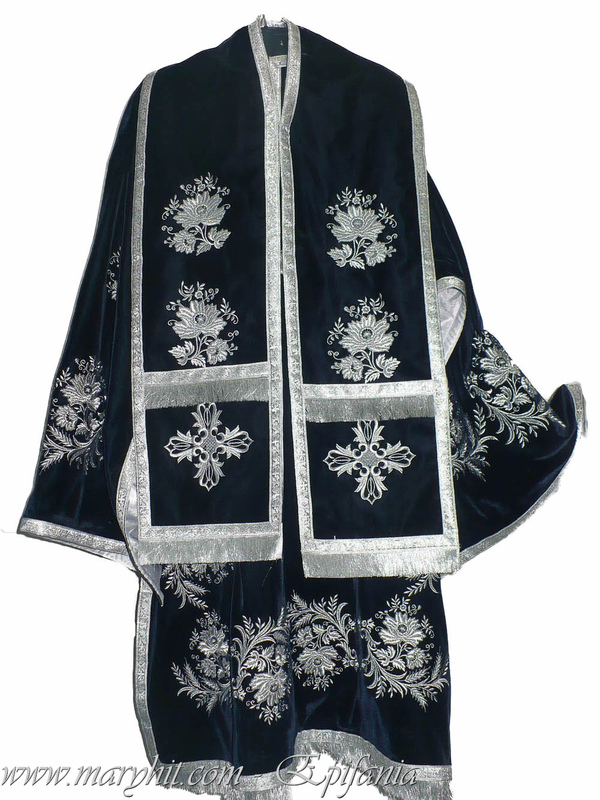 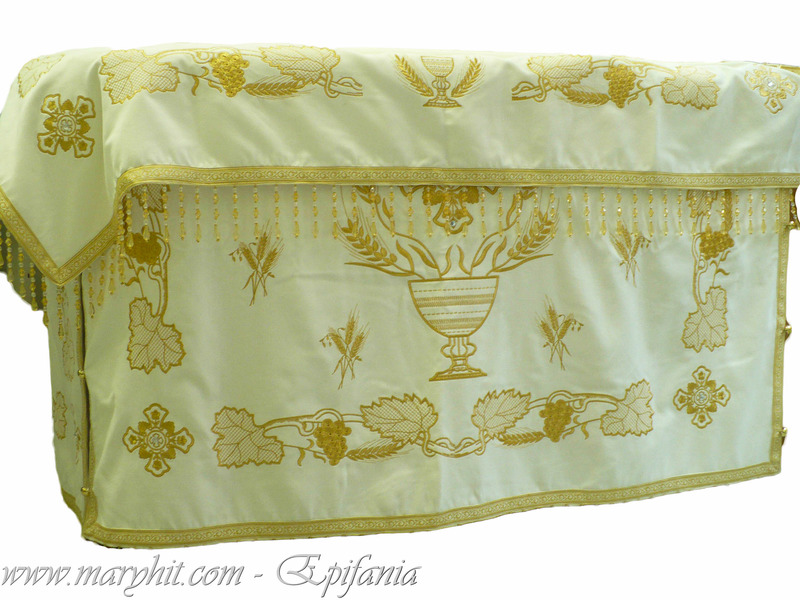 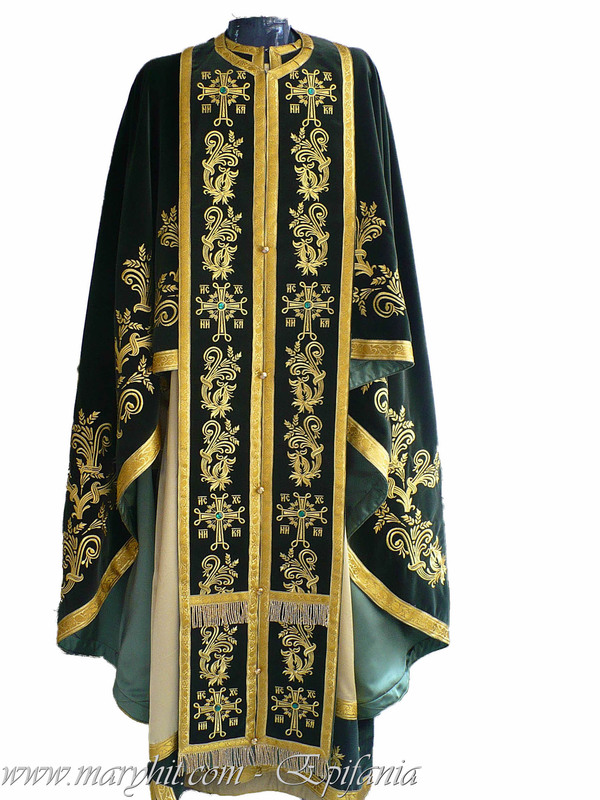 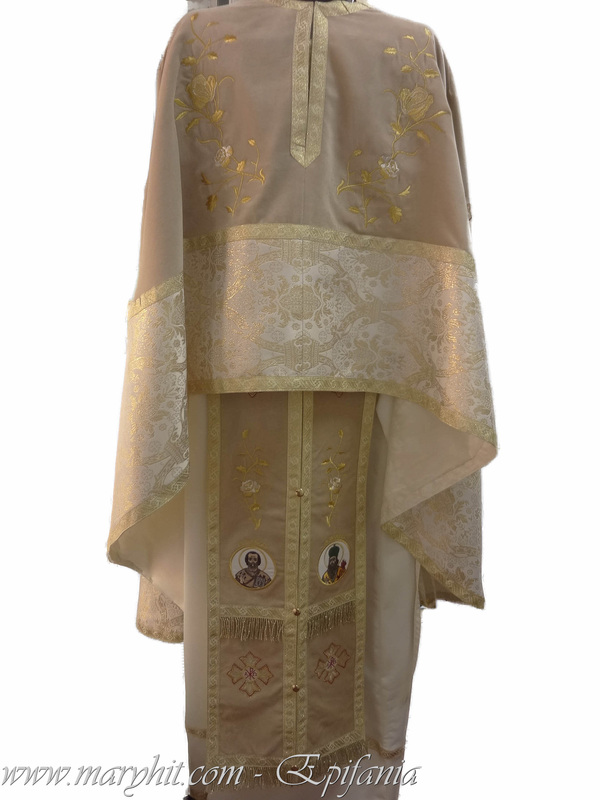 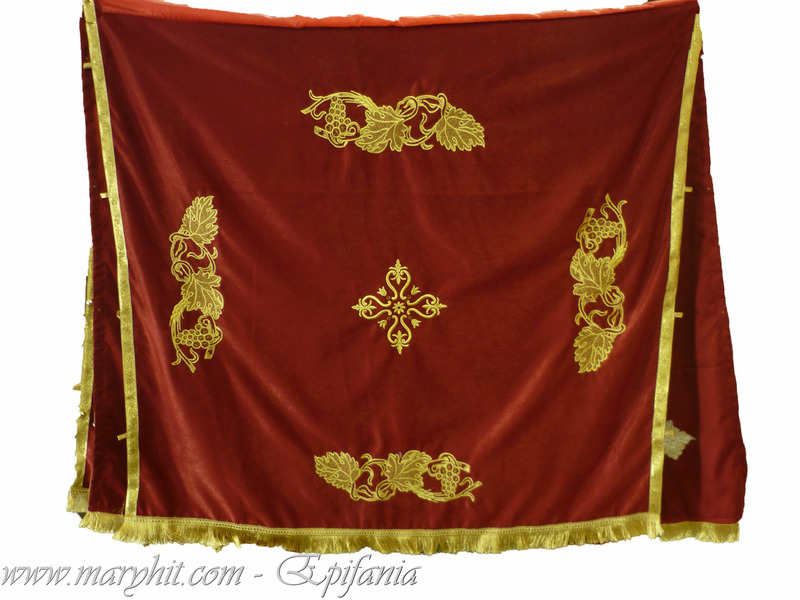 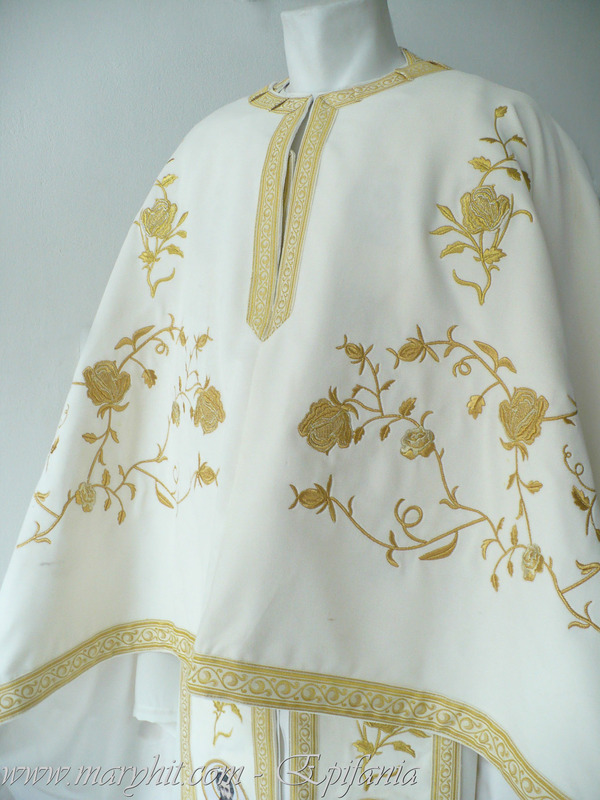 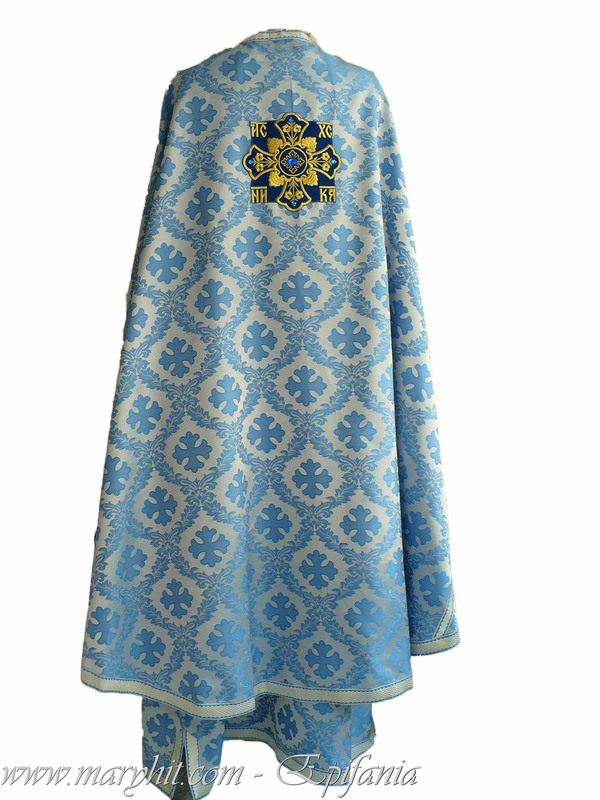 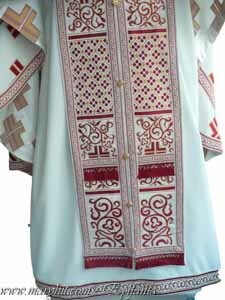 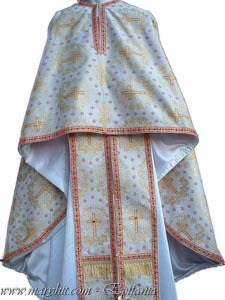 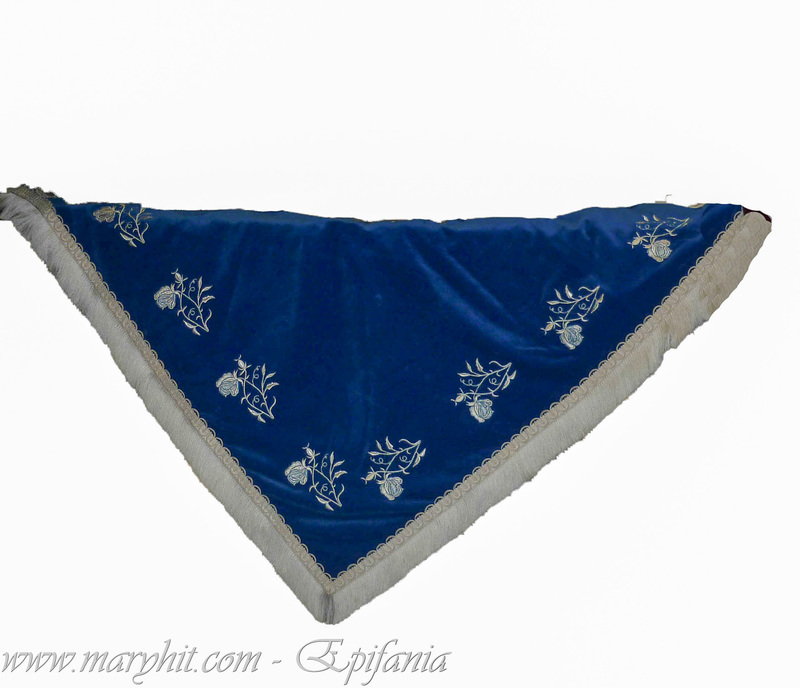 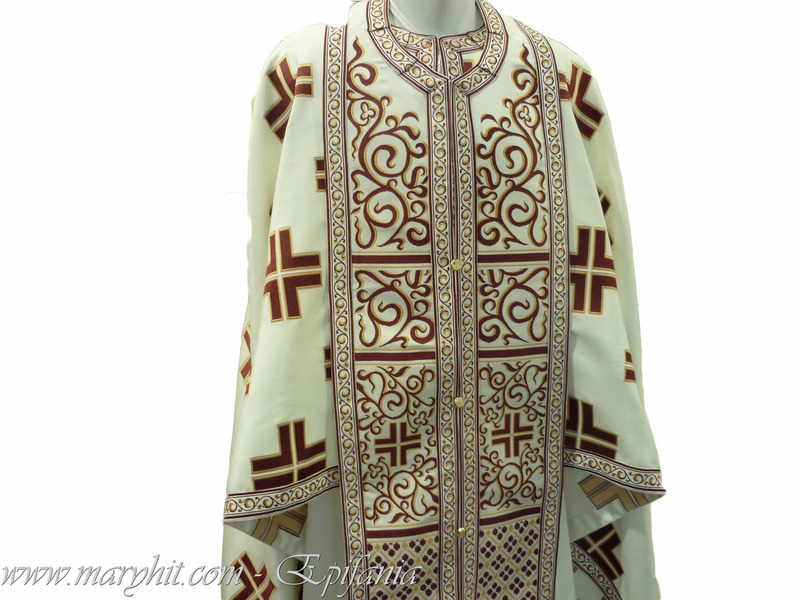 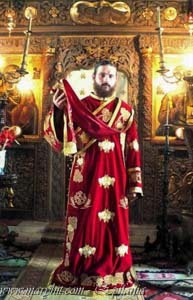 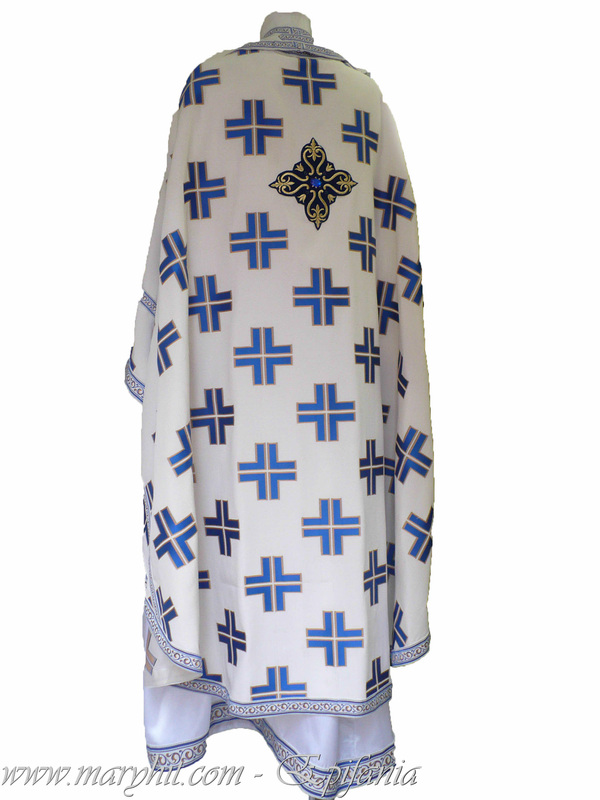 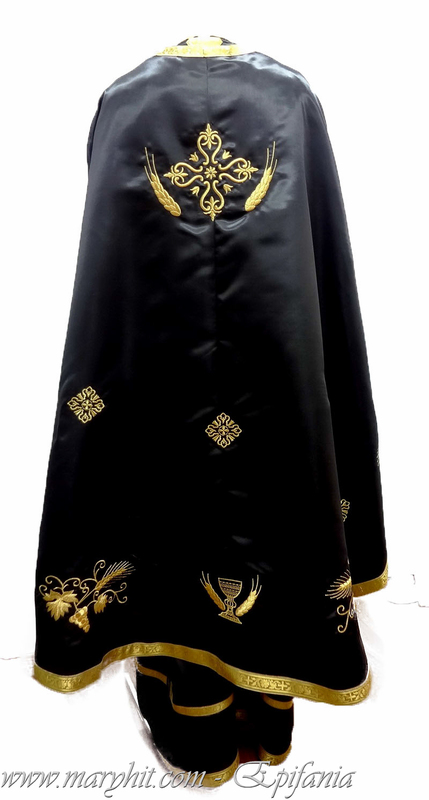 VP803 - Greek garb tissue with crosses albastre.Material high quality silk and lana.Apreciat and warm weather . 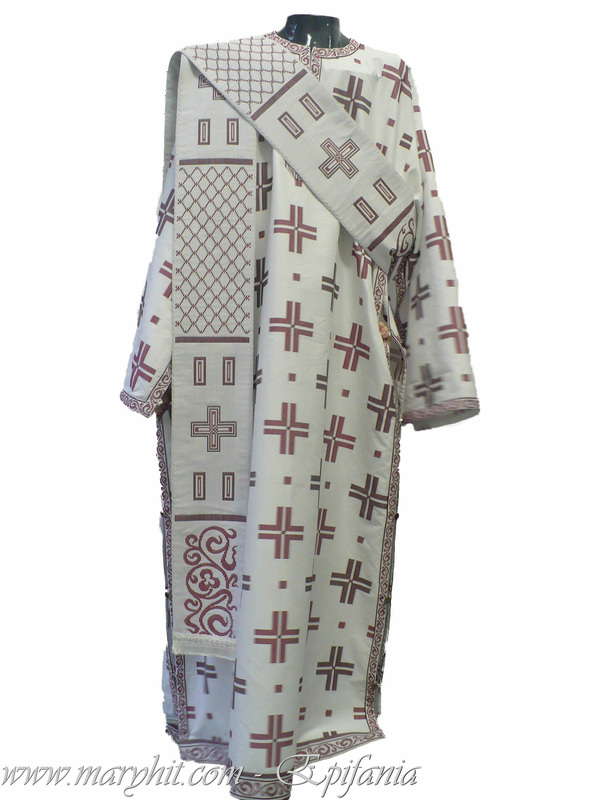 VP804 - brocade robe , white and shades of gray shade to alegere.Cruci embroidered auriu.Camasa applied. 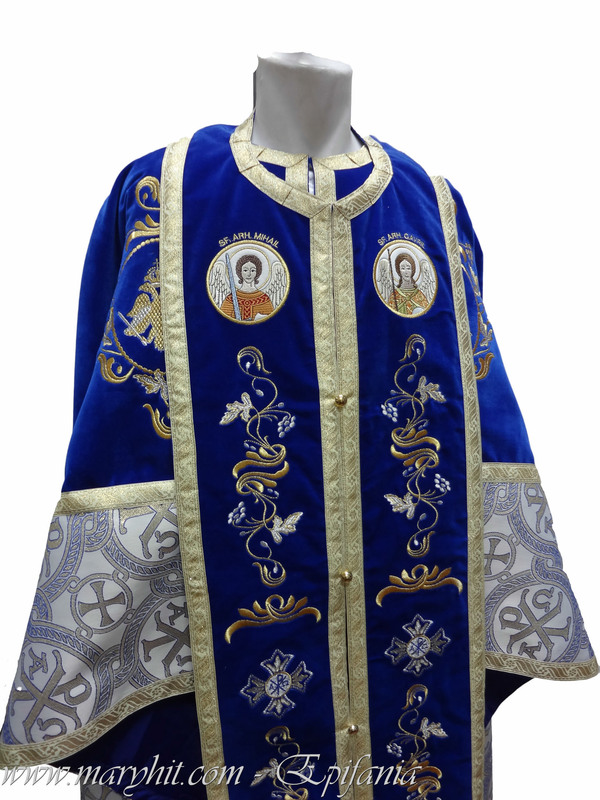 VP805 - Russian garment of brocade any color , icon or cross back . 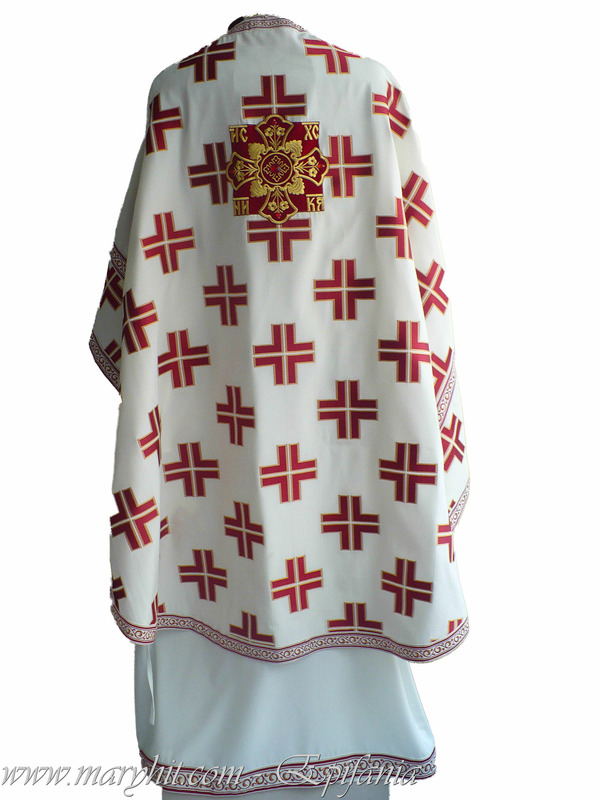 VP820 - Greek garb tissue with red crosses auriu.Material high quality silk and in.Apreciat and warm weather . VP850 - silk robe rosu.Deosebit easy, cool . 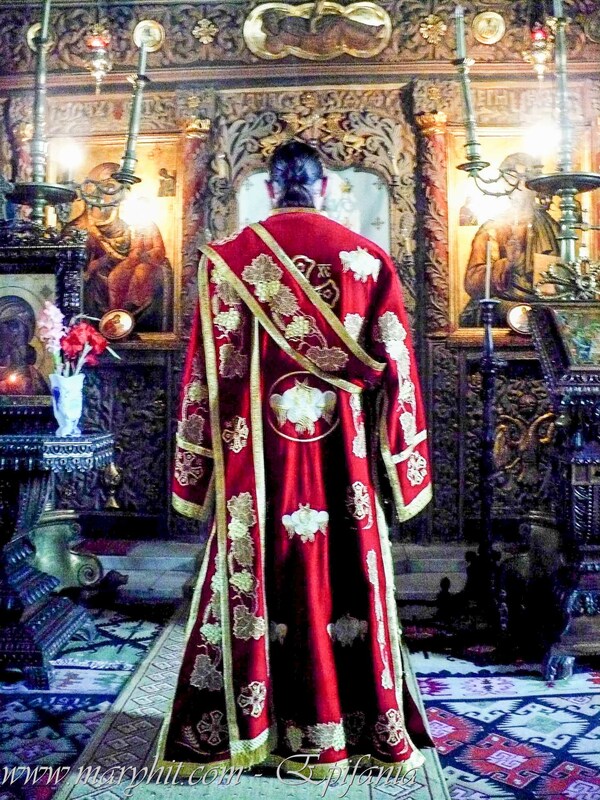 Model Romanian or Russian . 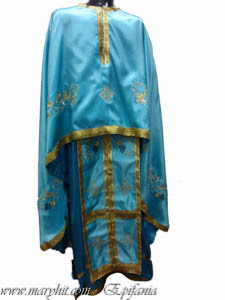 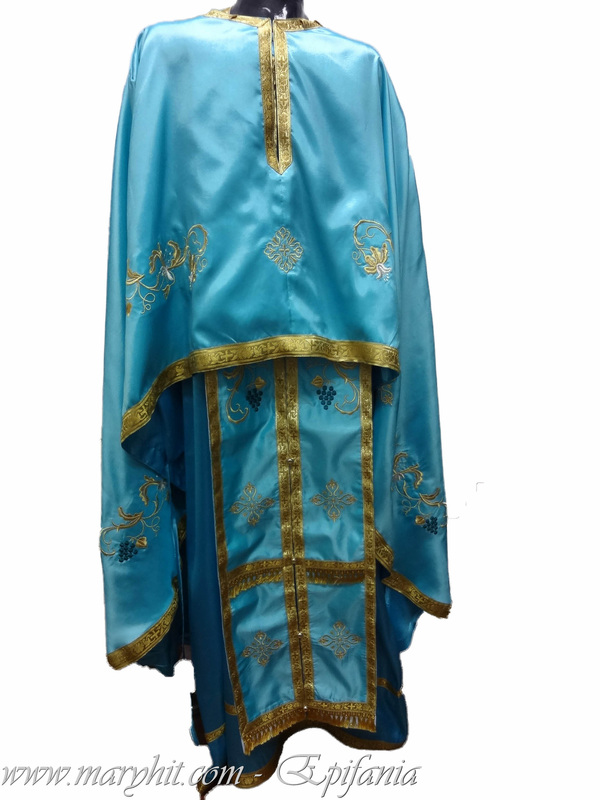 VP860 - light blue brocade silk garment Greece. Light and rich at the same time beautiful. VP861 - gold brocade silk garment Greece. 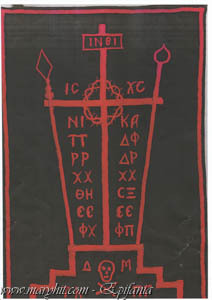 IC XC NIKA Medallion . 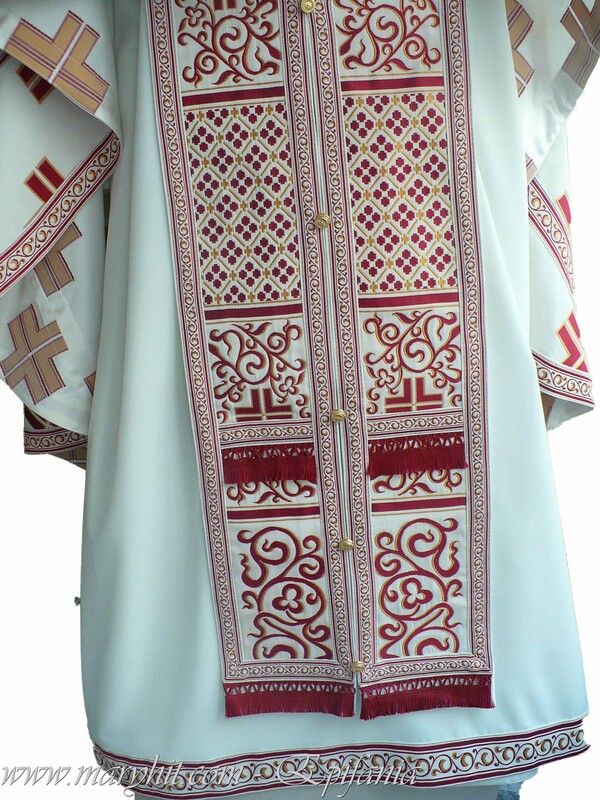 Easy , yet rich frumos.Nu require lining and shirt is marochen . 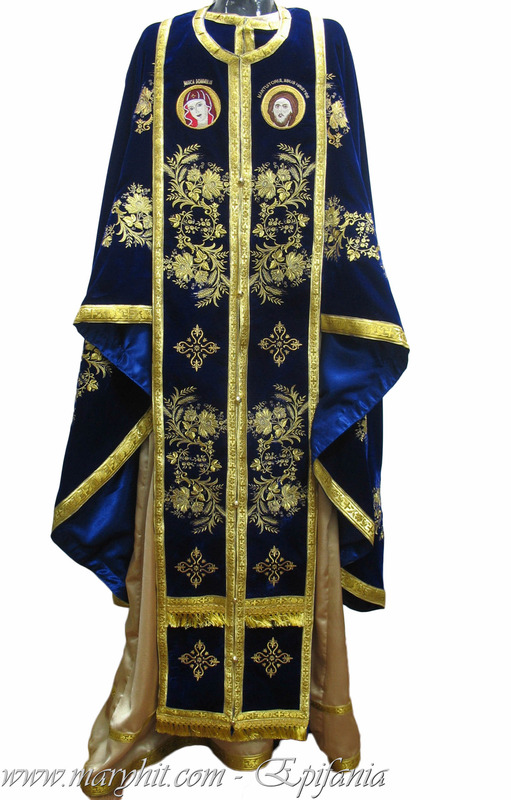 VP862 - gold brocade silk garment Greece. 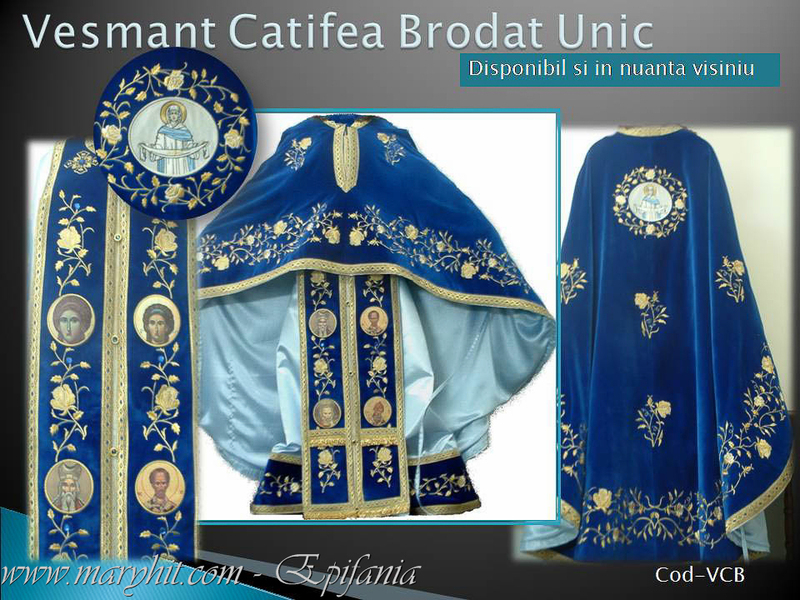 Easy , yet rich frumos.Nu require lining and shirt is marochen . Gallon matching . 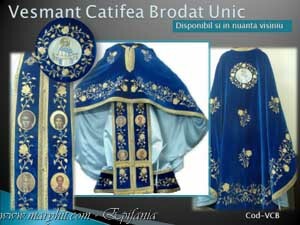 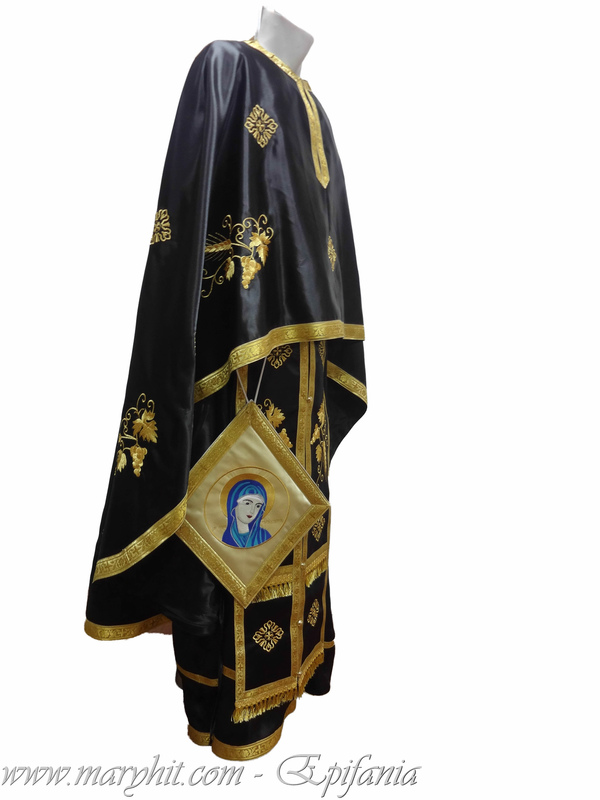 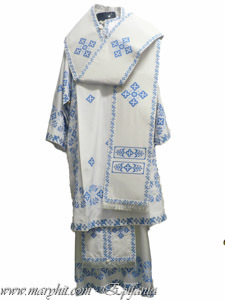 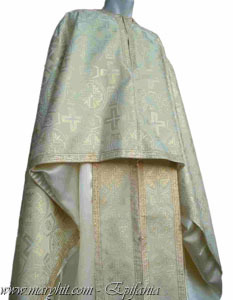 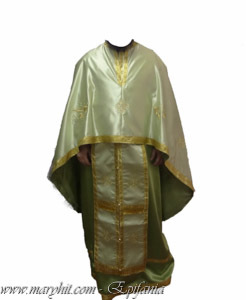 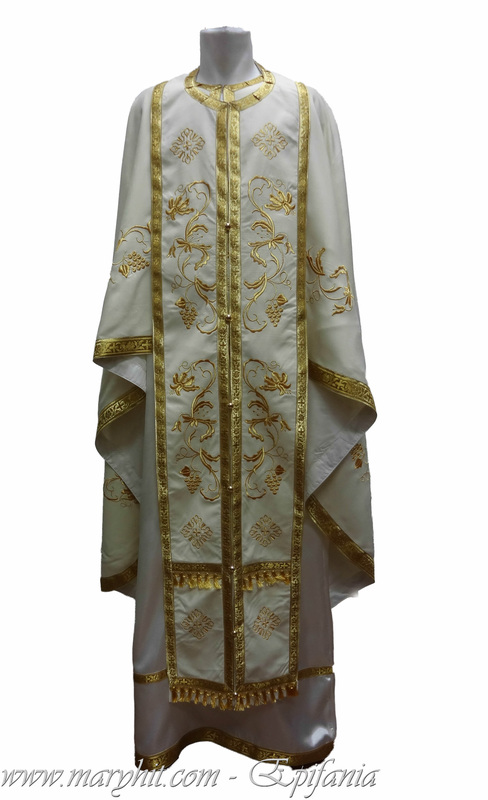 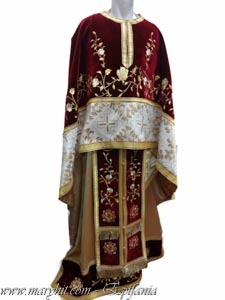 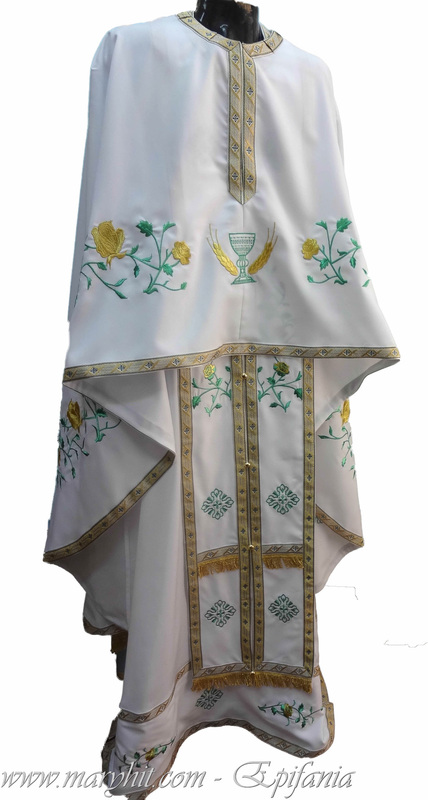 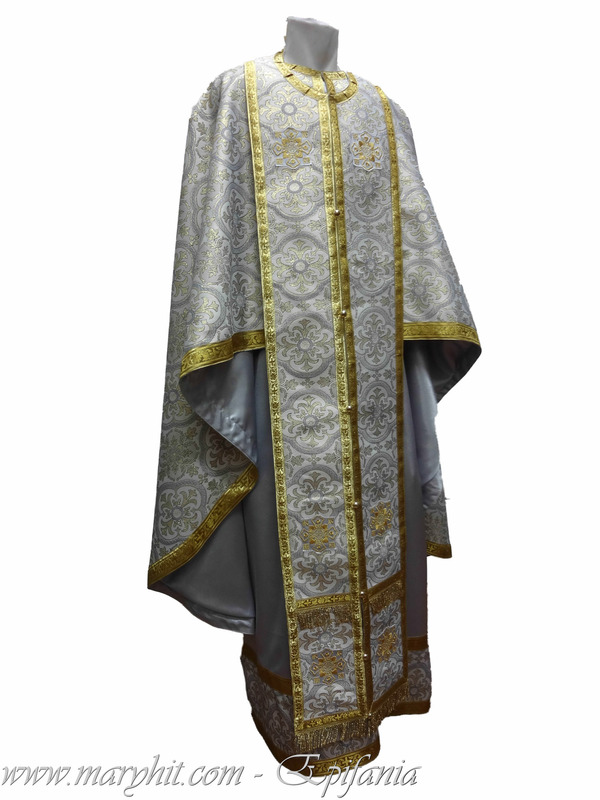 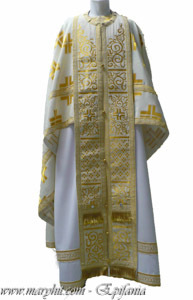 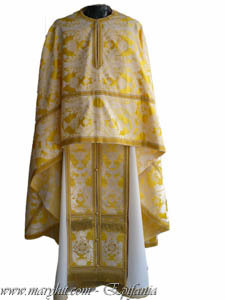 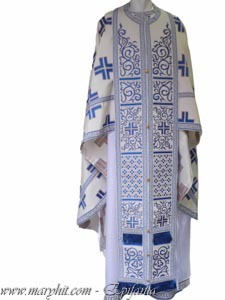 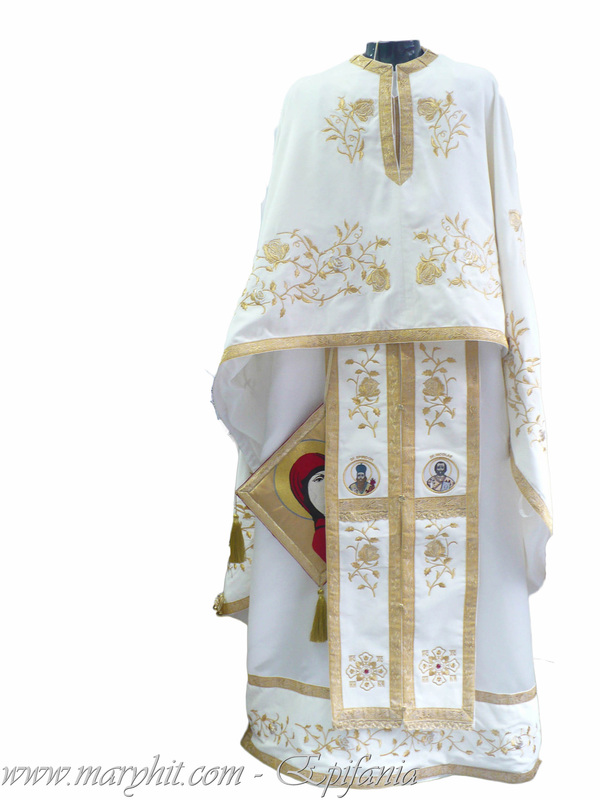 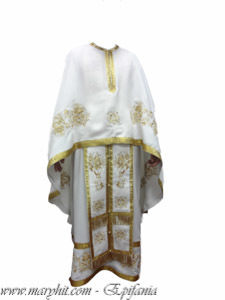 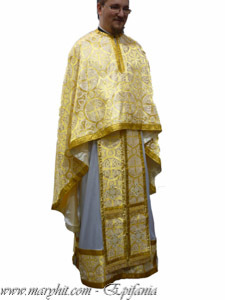 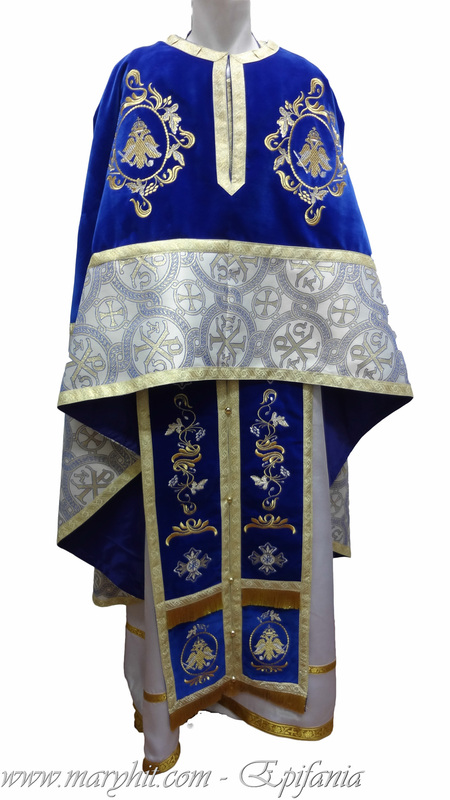 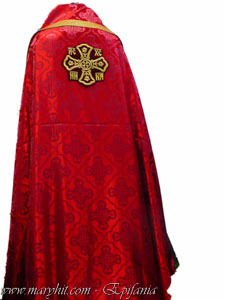 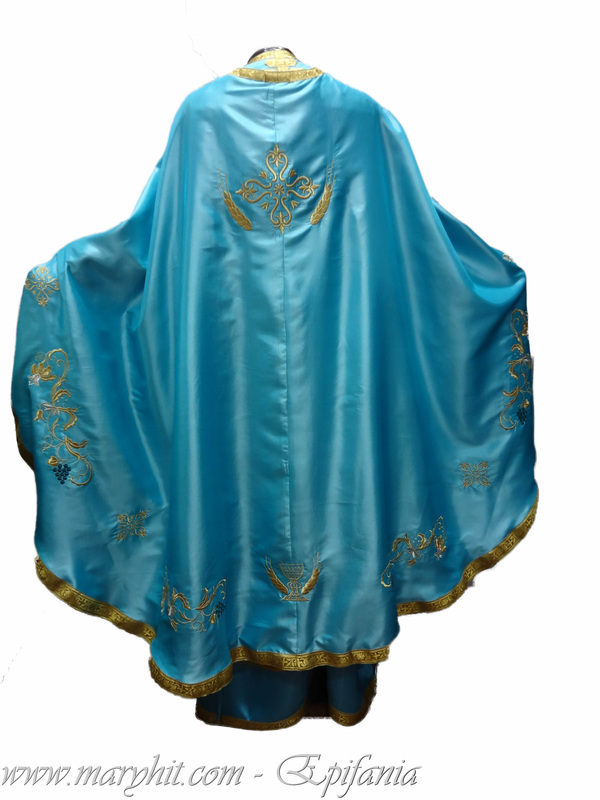 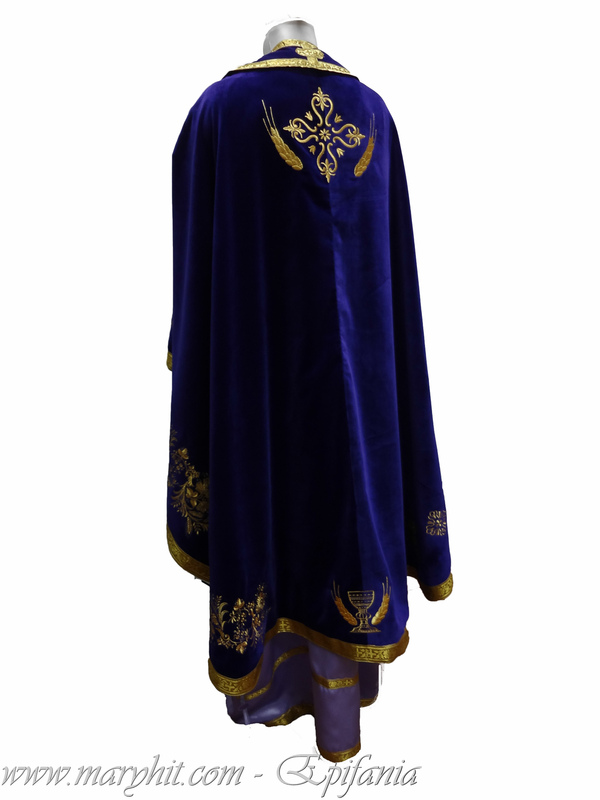 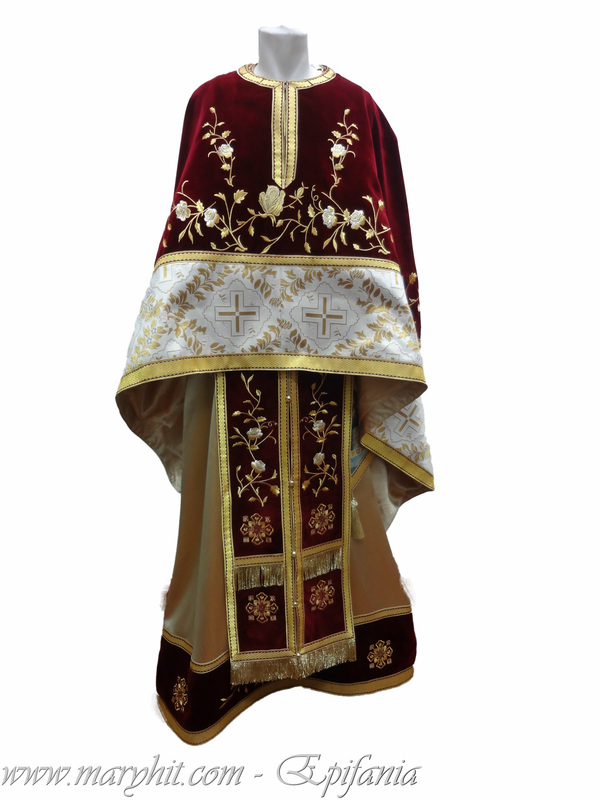 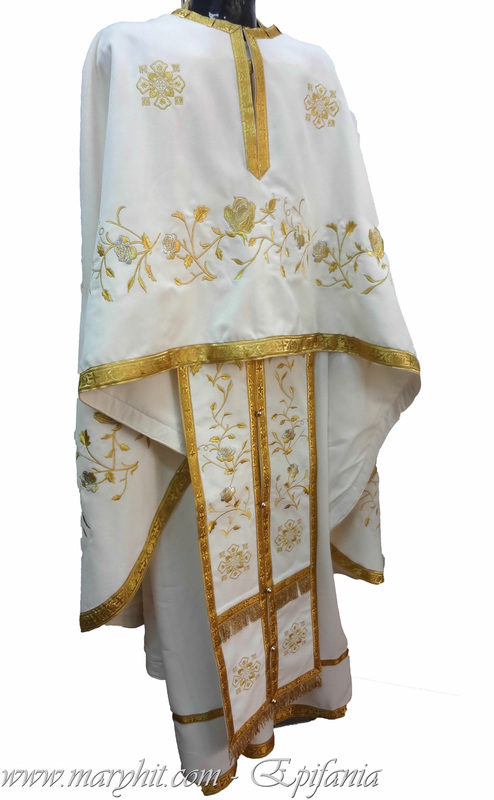 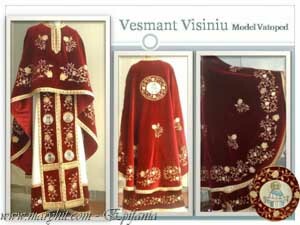 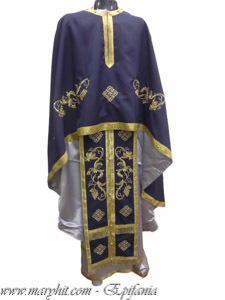 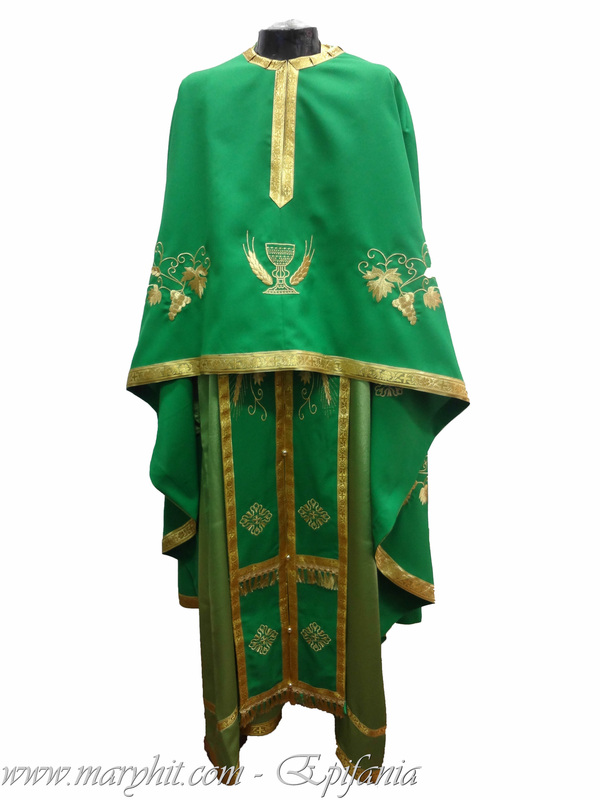 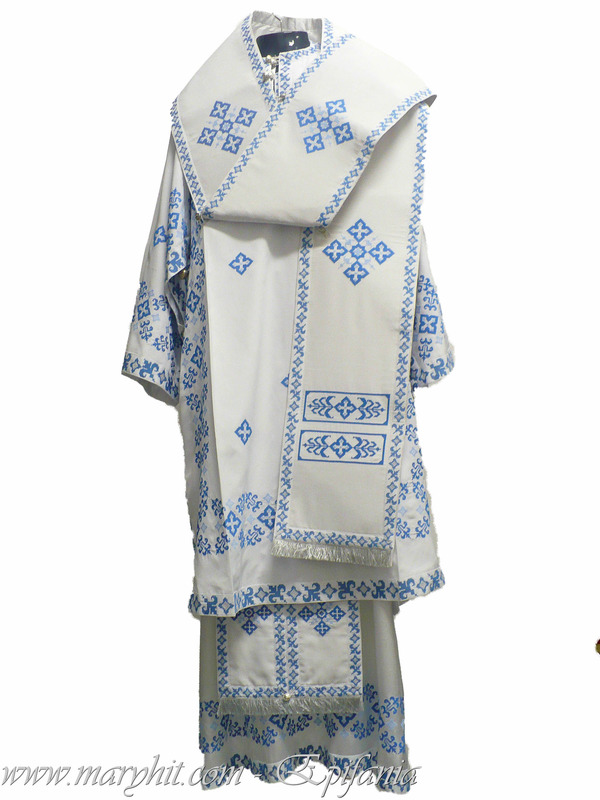 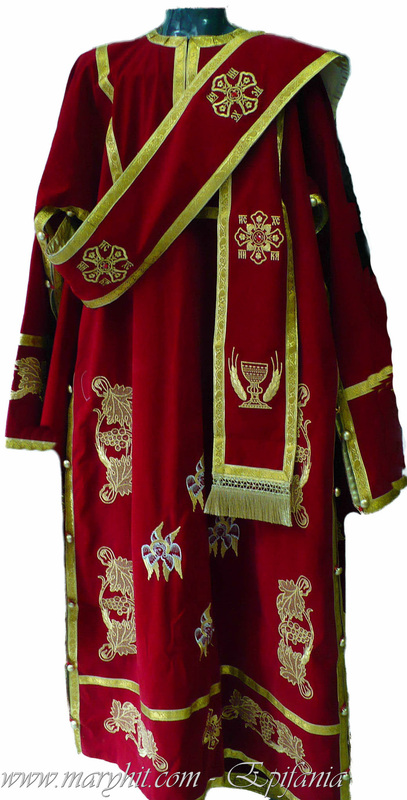 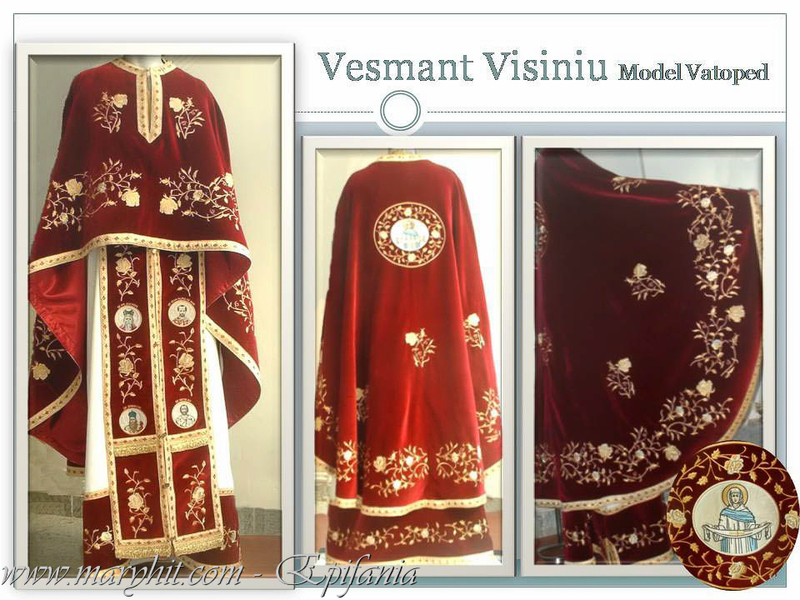 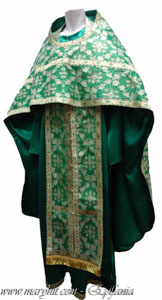 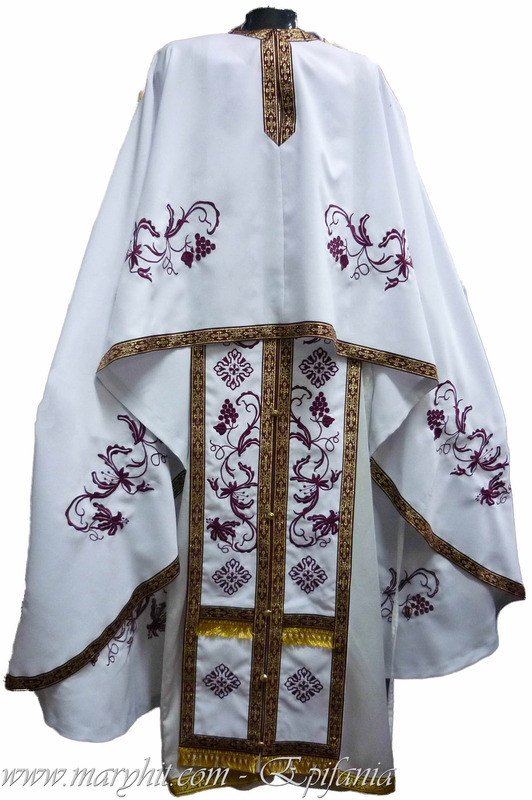 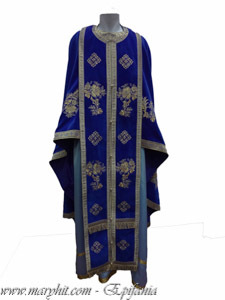 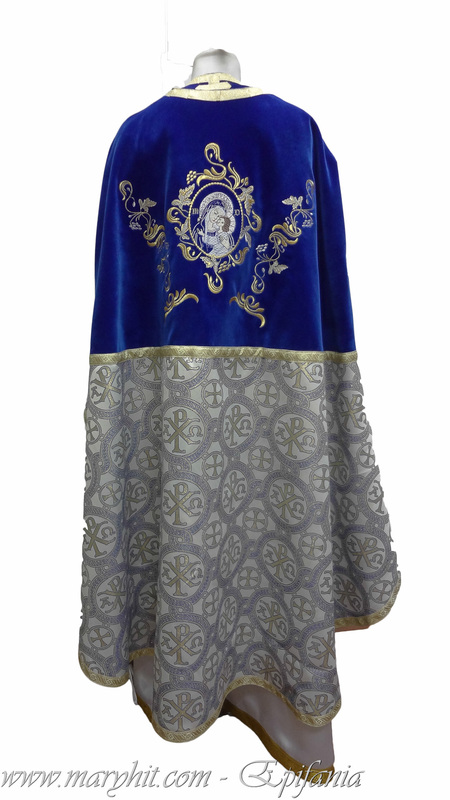 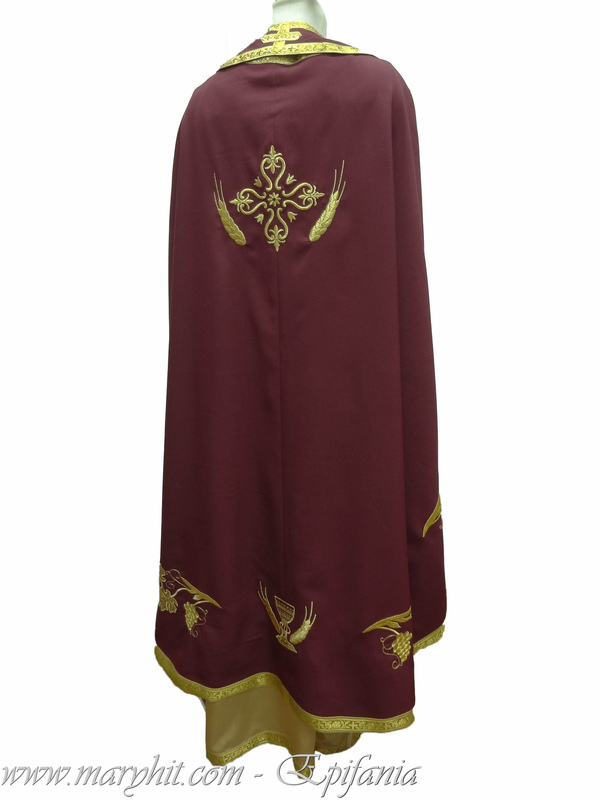 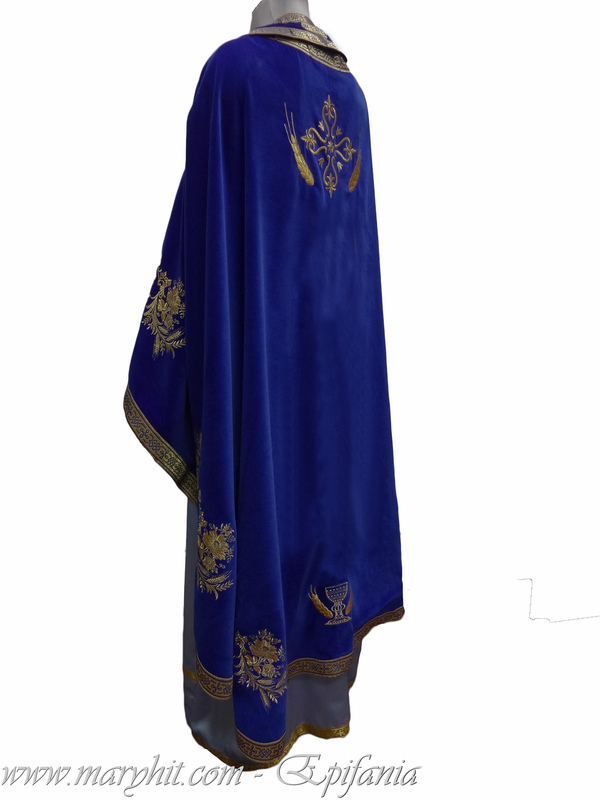 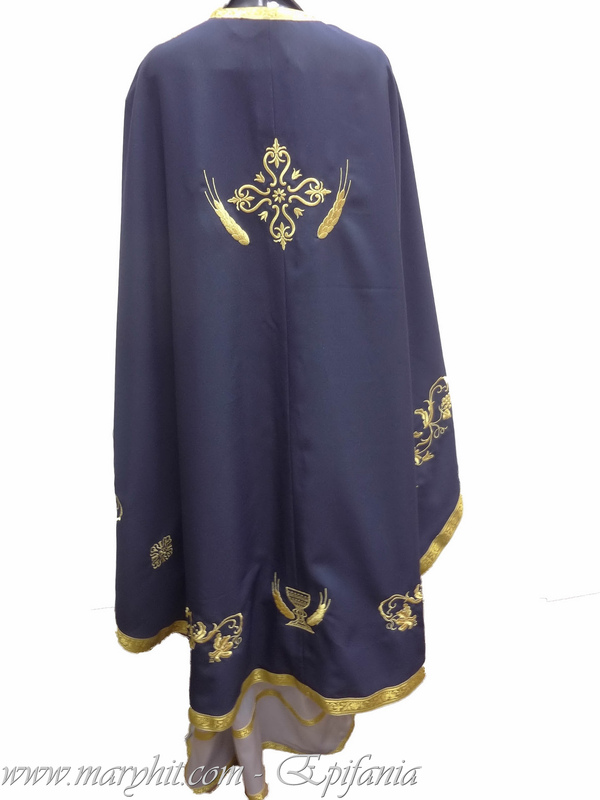 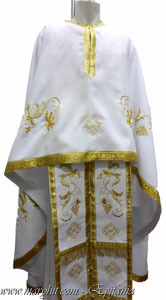 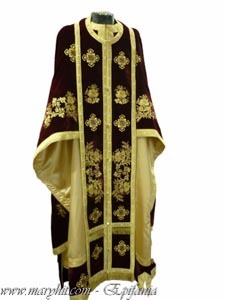 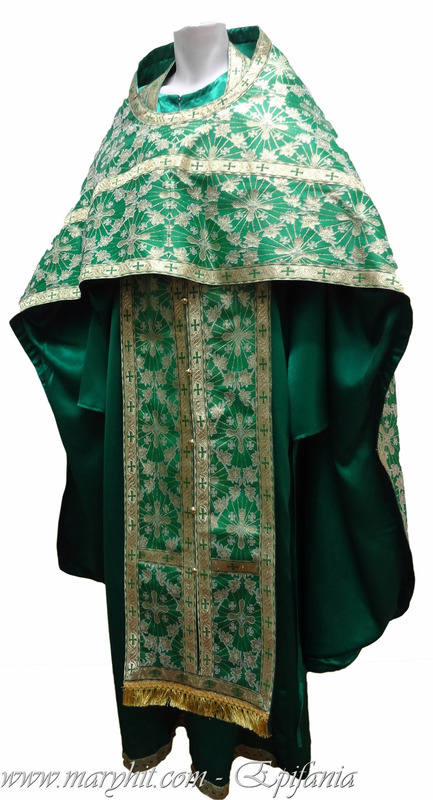 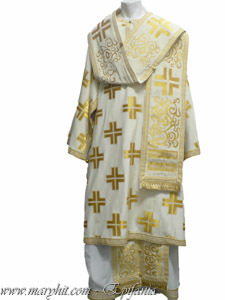 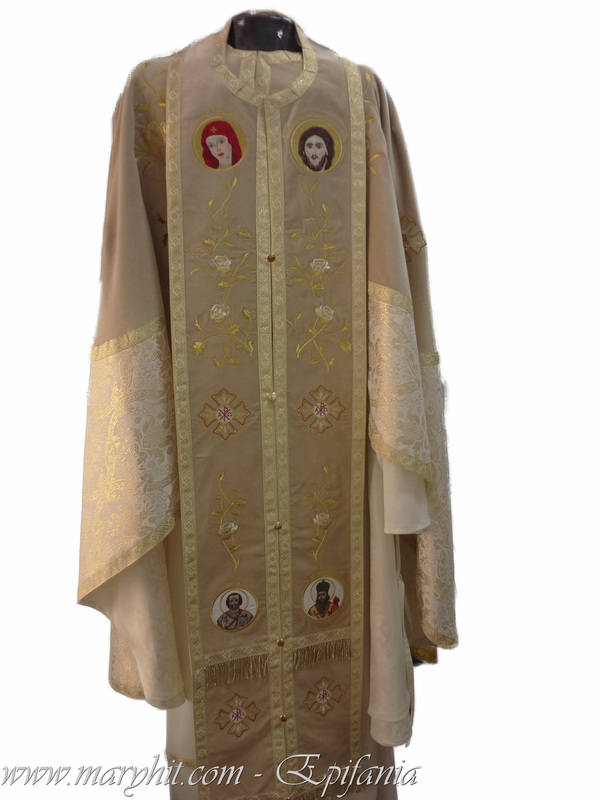 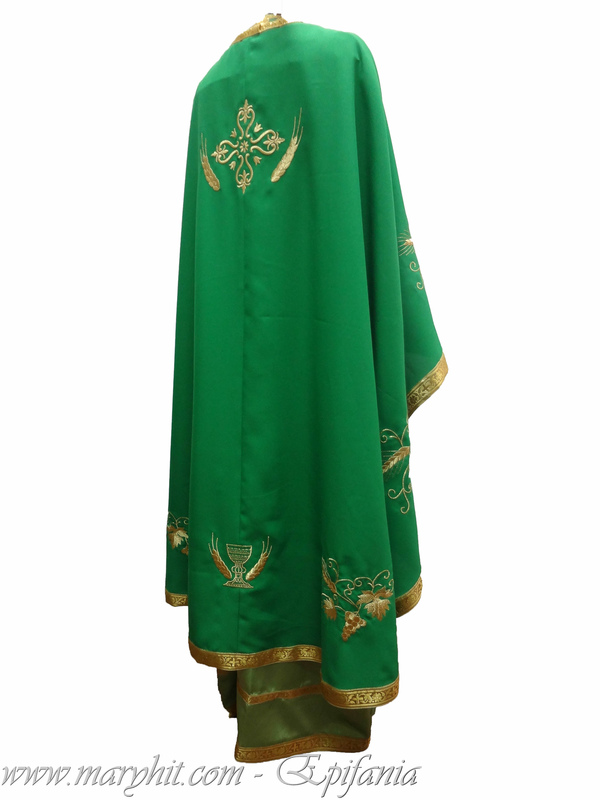 VP900 - it combined priestly vestments comprise one of the most beautiful works of Epiphany . 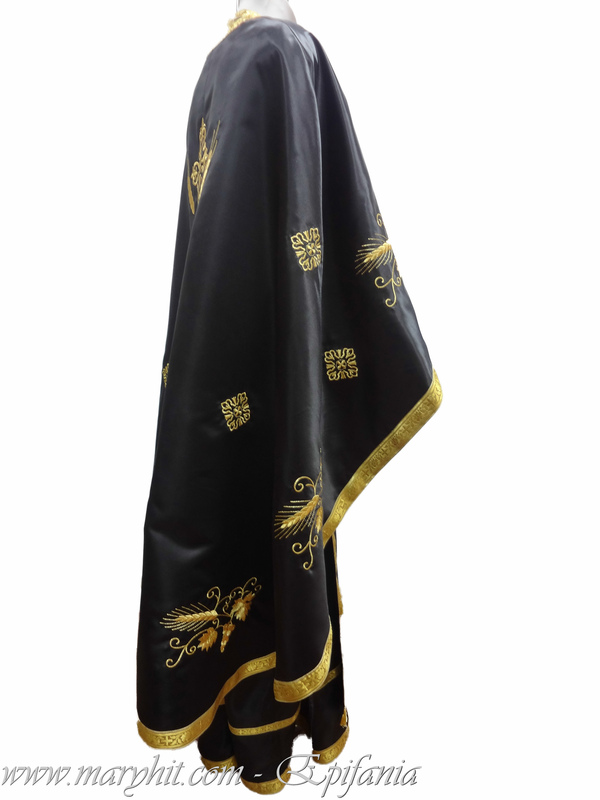 Combining bold colors with complementary shades Brocard maintain color balance . 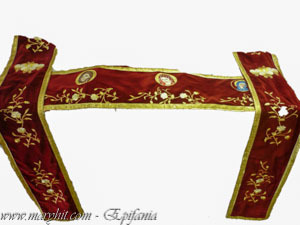 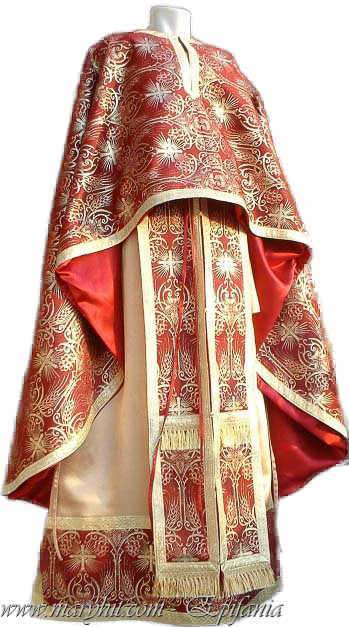 VP902 - red vestment brocade fabrics combined . Double-headed eagle embroidery medallions . 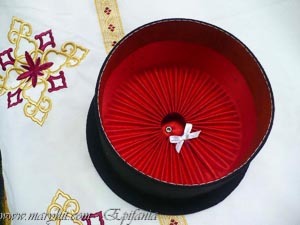 It can be done in different colors. 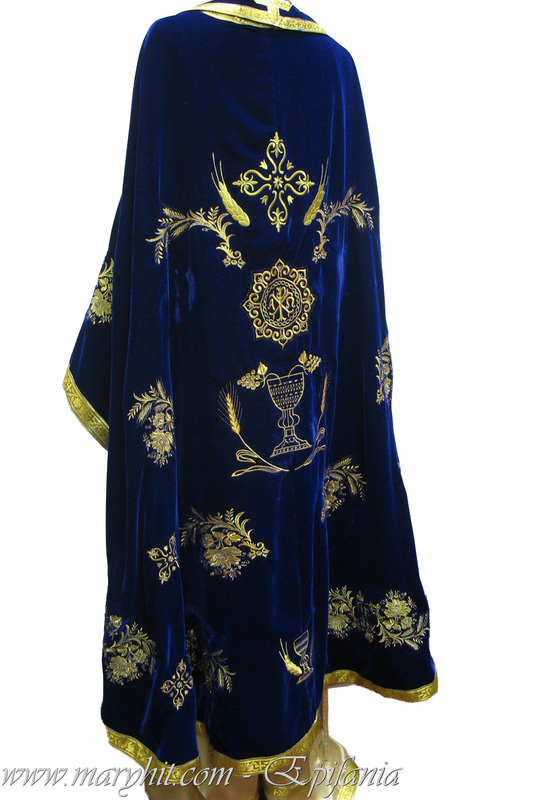 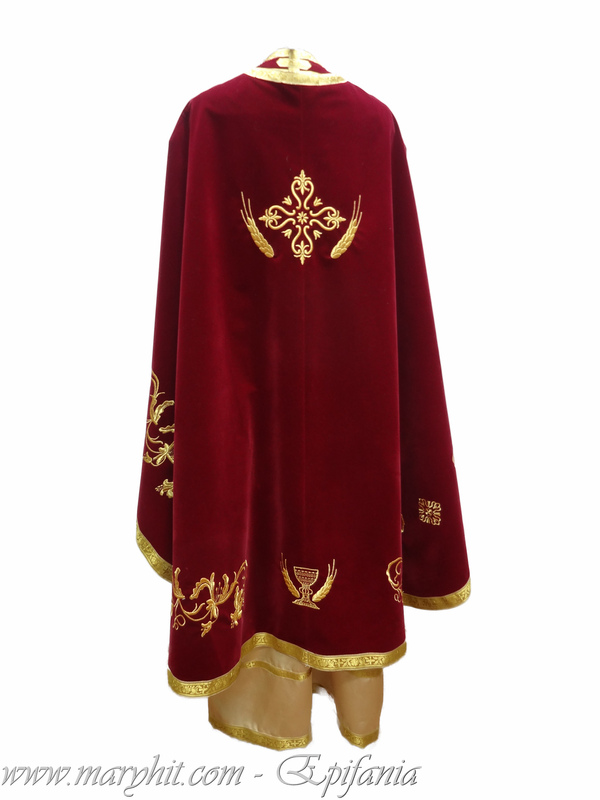 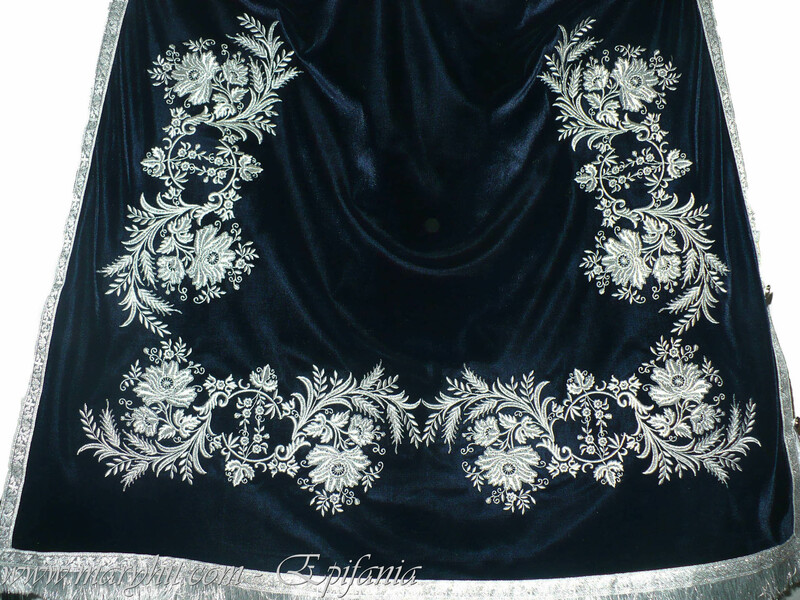 VP903 - Usually this type of combination of velvet and brocade is used in Russian garb , give a very balanced color . R001 - Reverend peach Greek model . 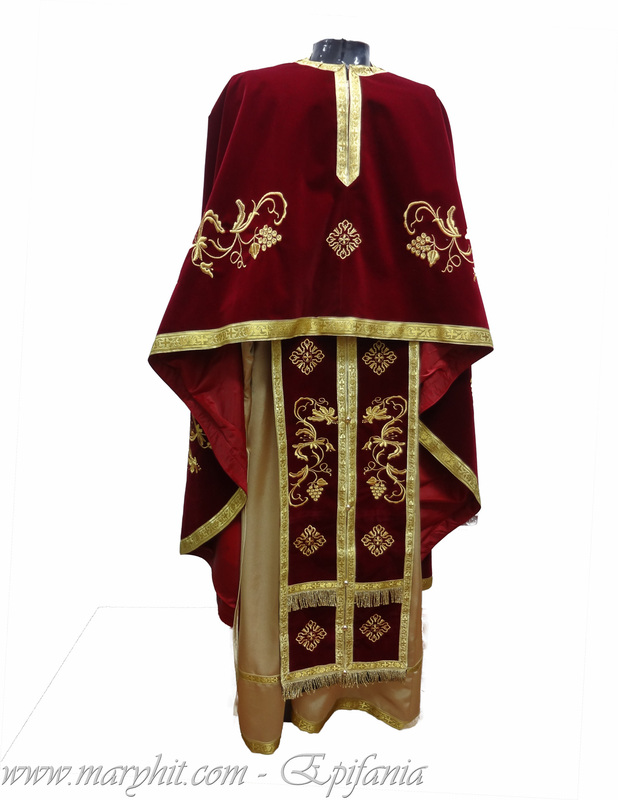 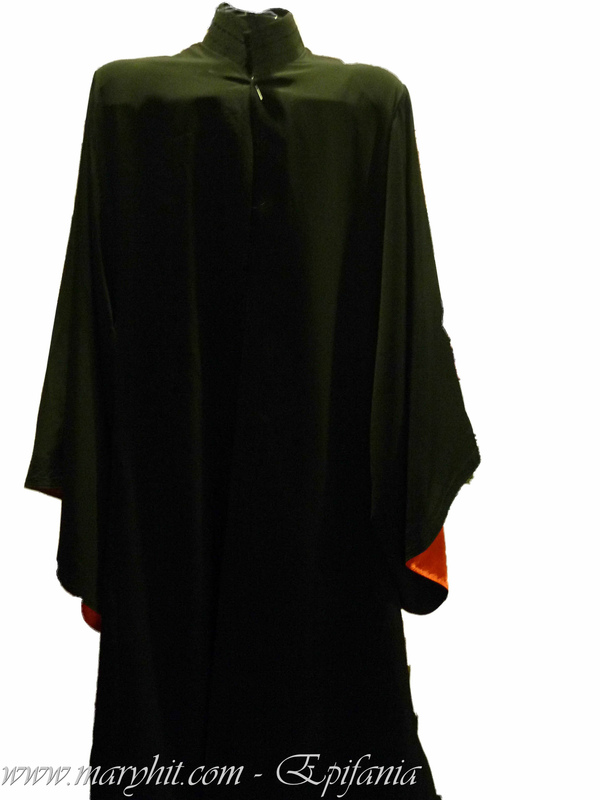 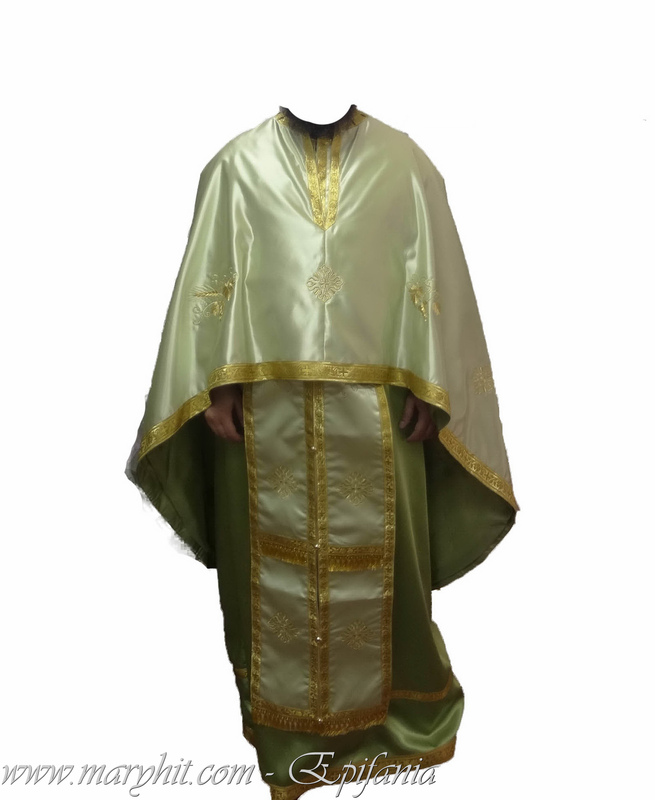 R002 - Reverend silk Greek model ( marochen ) . 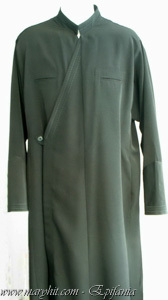 Material of natural fiber recommended for summer and high temperatures. 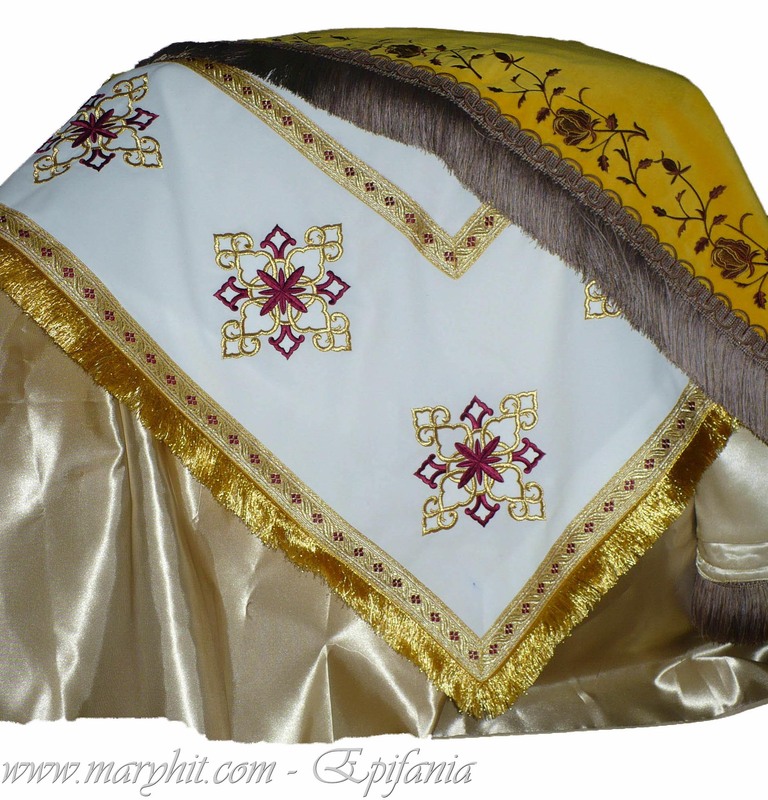 R003 - Reverend Romanian model silk ( marochen ) . 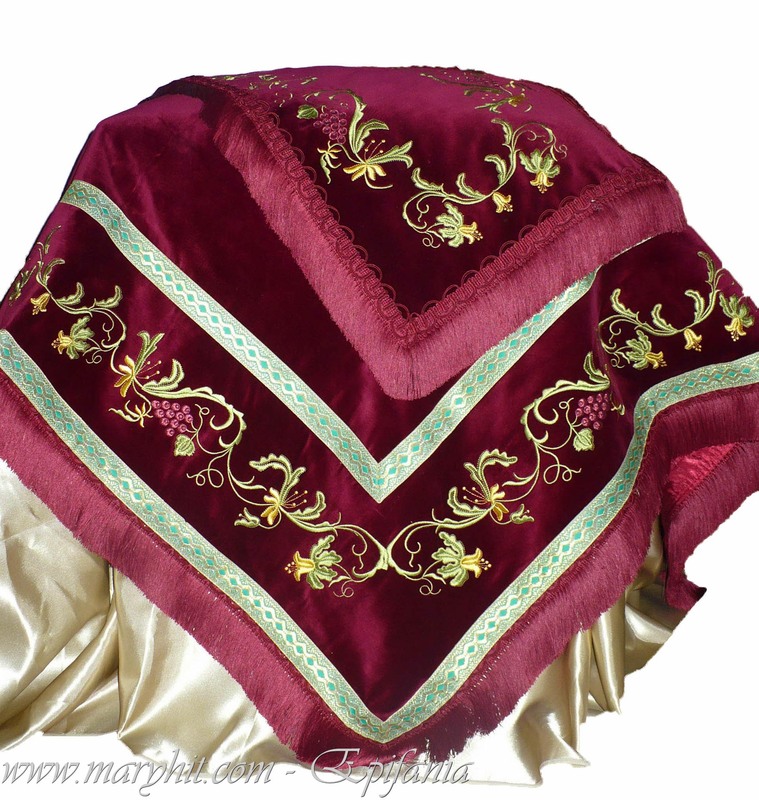 Material of natural fiber recommended for summer and high temperatures. 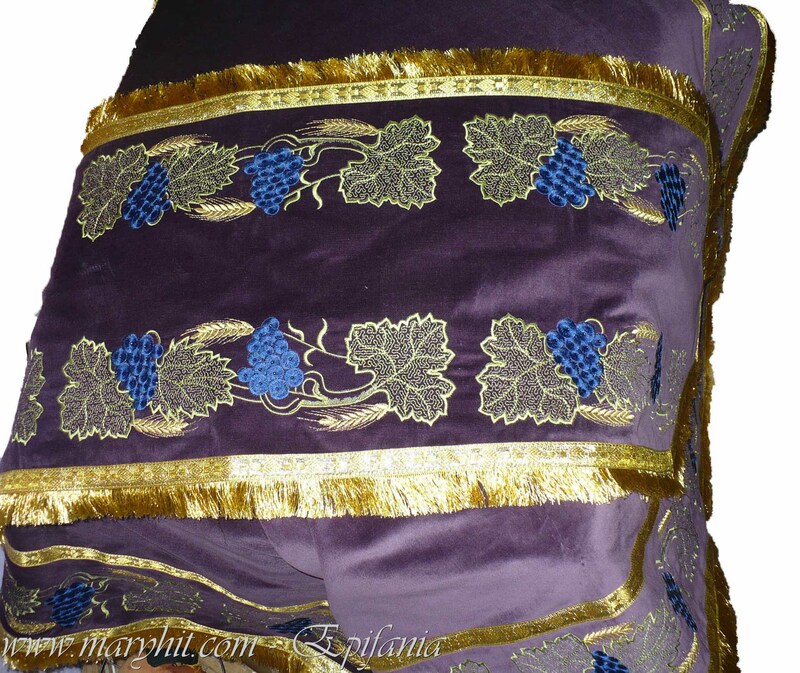 R004 - Race silk Greece ( marochen ) . 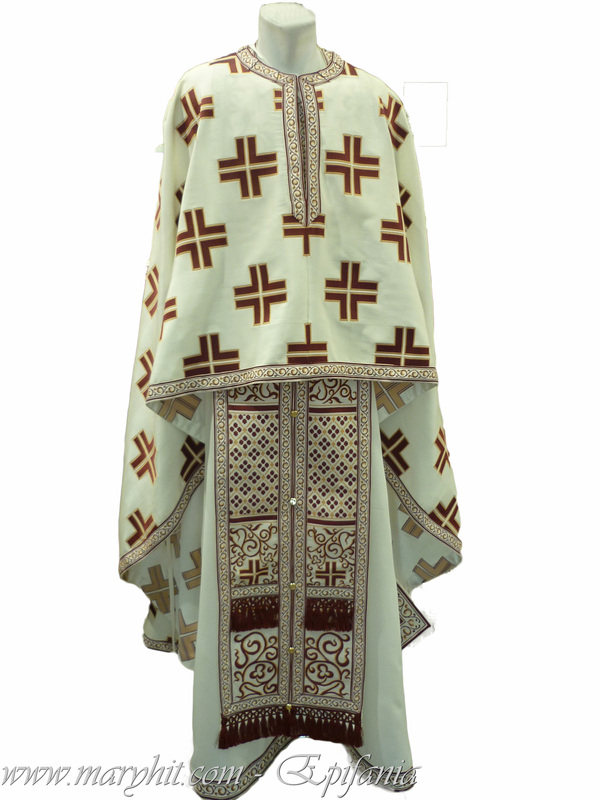 Material of natural fiber recommended for summer and high temperatures. 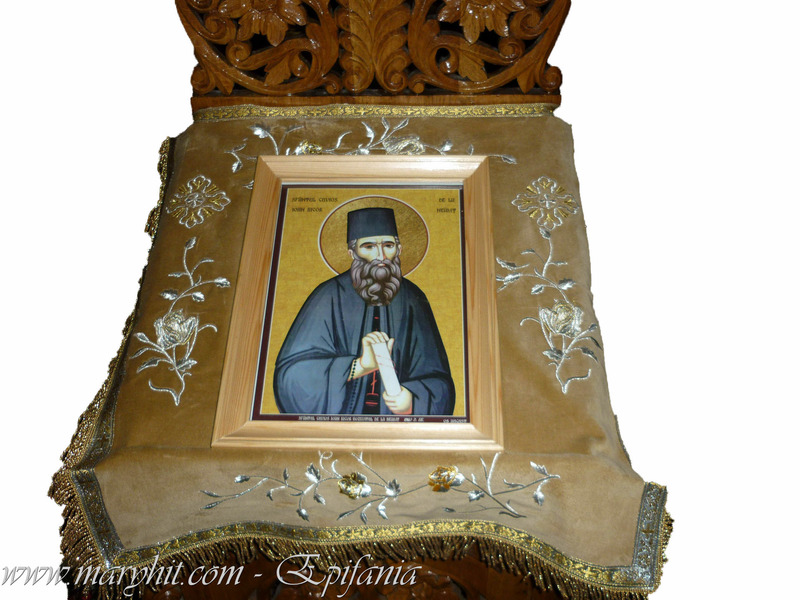 R005 - Skuphia (Skoufos, Skufia, Culion)commissioned by the interior color choice. 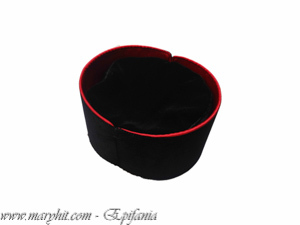 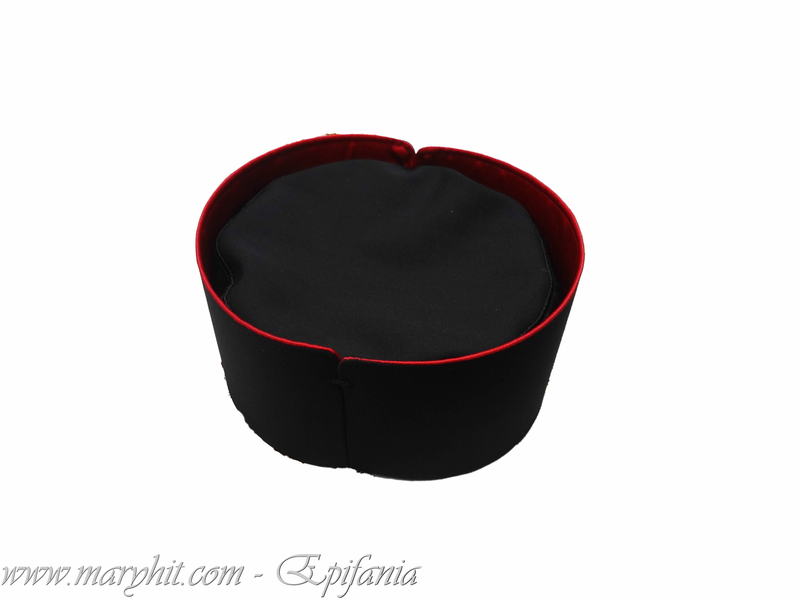 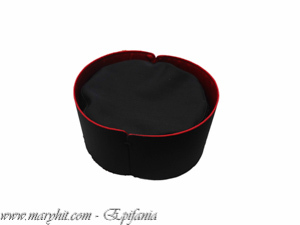 R006 - Skuphia (Skoufos, Skufia, Culion) red velvet edge ( black can be done ) . 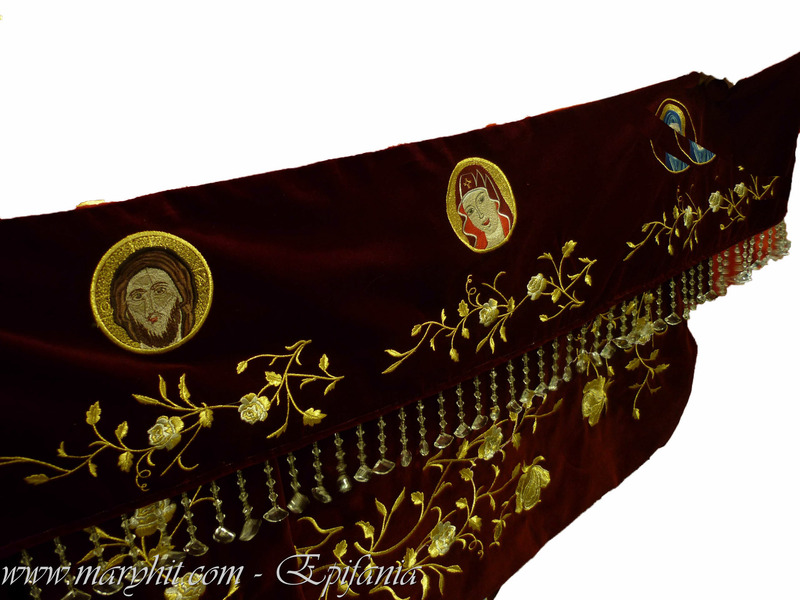 R007 - Skuphia (Skoufos, Skufia, Culion) tergal edge of red ( and black can be done ) . 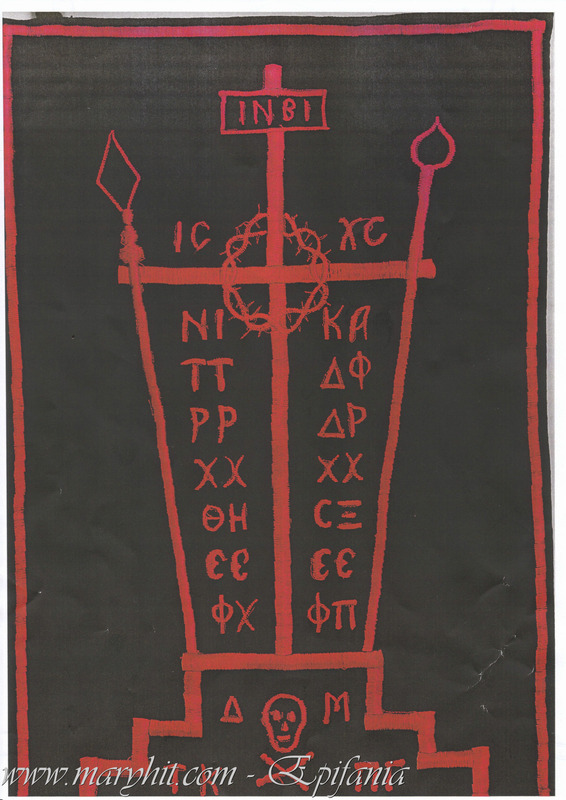 R008 - Schema embroidered with red thread on peach - material removal. 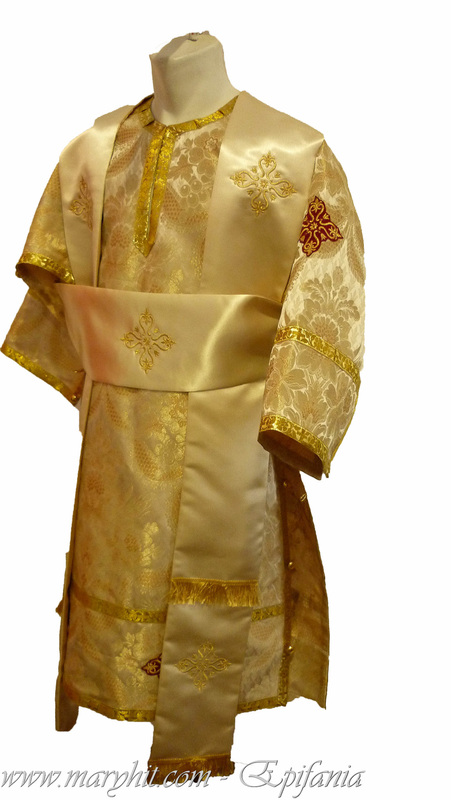 R009 - Suit Jacket priest - edge seminar brodata.Poate be made of peach - silk - Delete. 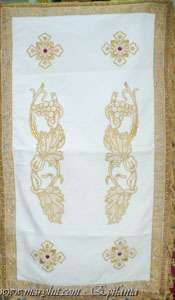 IB001 - Holy Altar Tablecloth embroidered velvet patterned white grapes and ears . 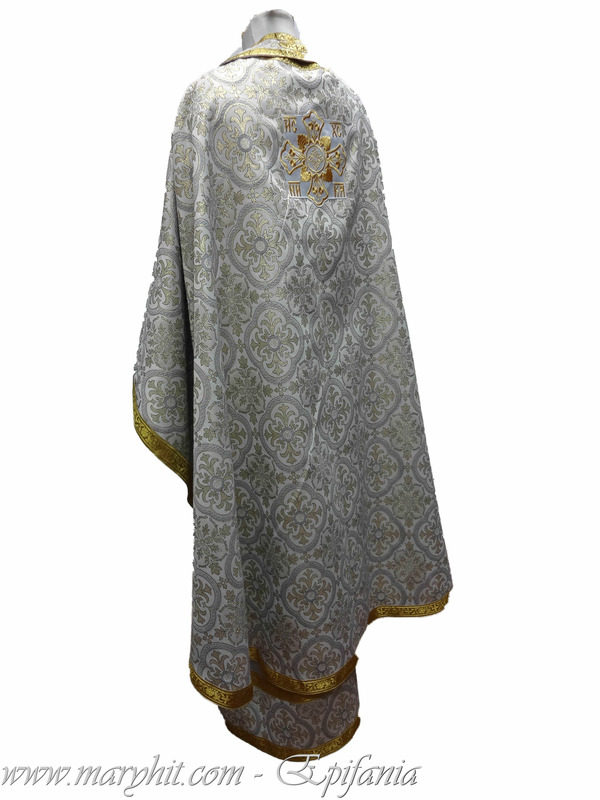 IB002 - Church Clothes white velvet embroidered with grape pattern . 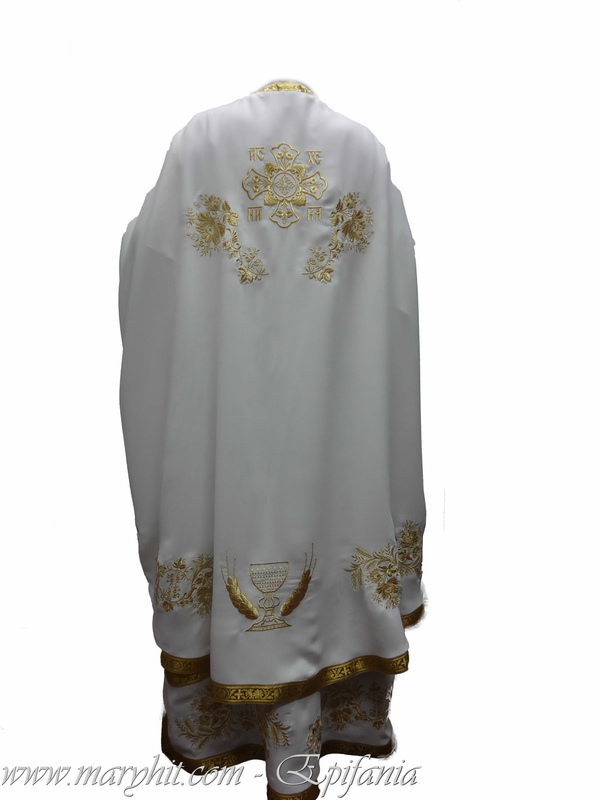 IB003 - Church Clothes white velvet embroidered with grape pattern . IB004 - Clothing church of black velvet embroidered with grapes and crosses pattern specific for the fasting period . 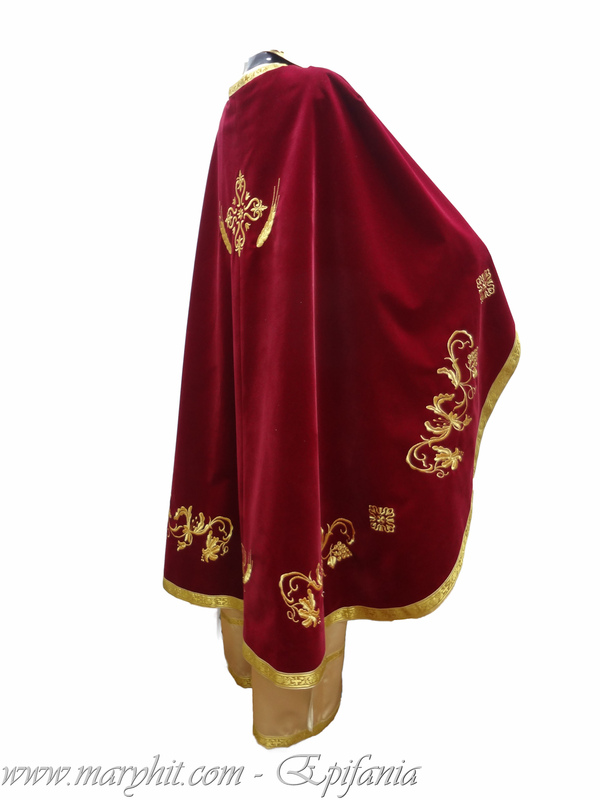 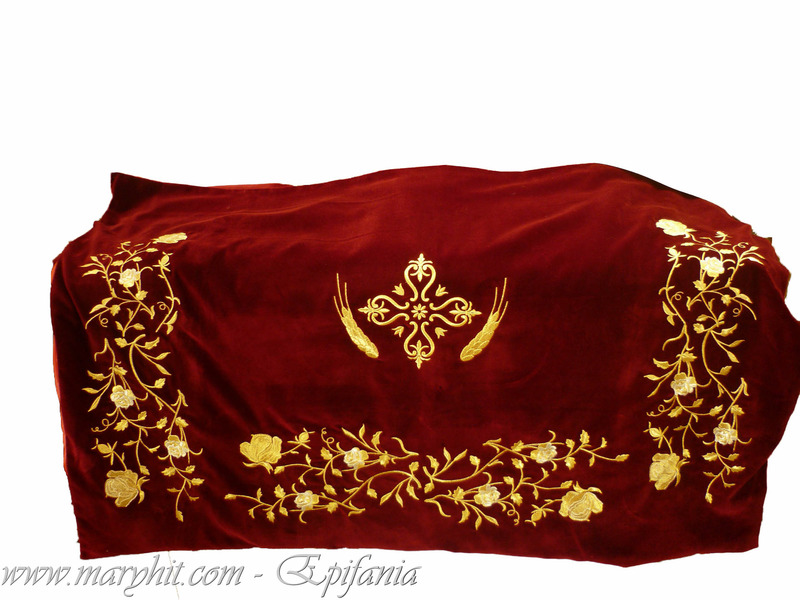 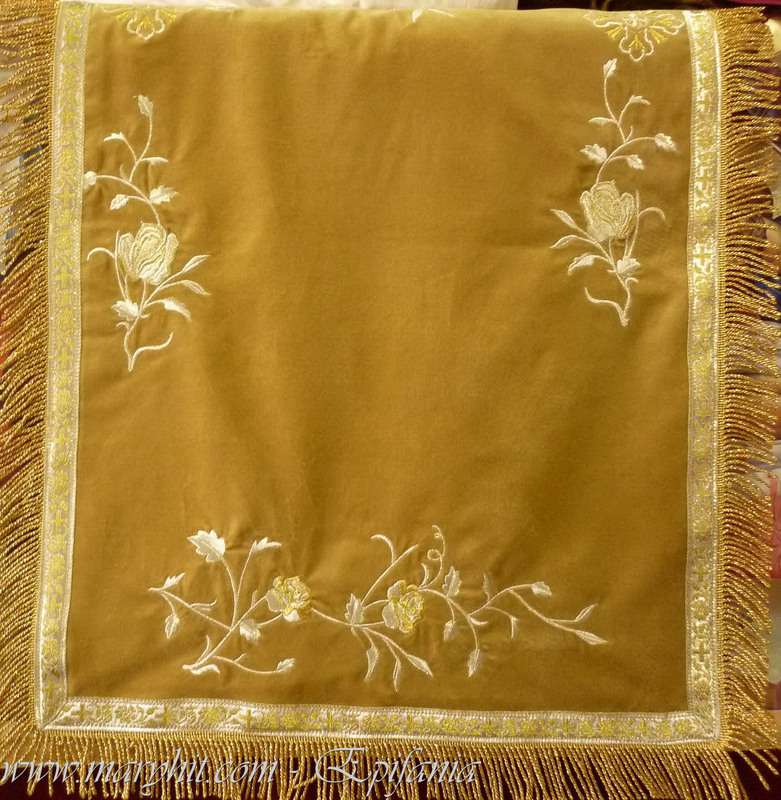 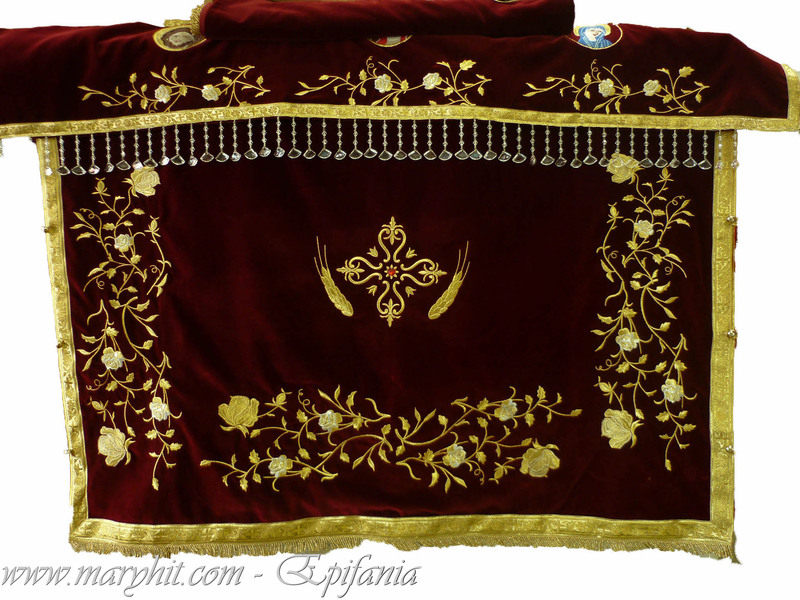 IB005 - Tablecloth for Holy Shrine in burgundy velvet with golden thread embroidery rose pattern . IB006 - Coatings icon embroidery burgundy velvet roses and icons . IB007 - Tablecloth and napkin in blue velvet with white embroidery rose pattern . 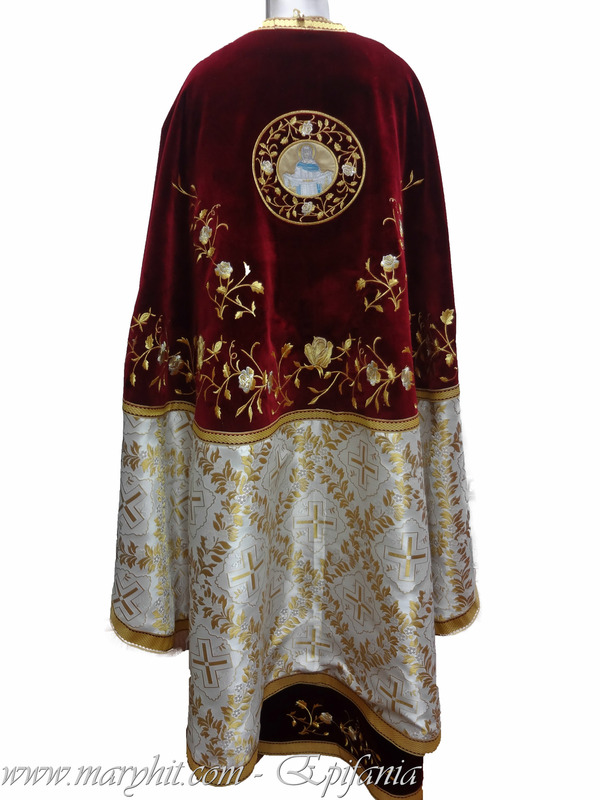 IB008 - Clothing church beige patterned velvet roses. IB010 - Girl napkin table and dark green velvet with gold + silver thread embroidery , pattern roses. 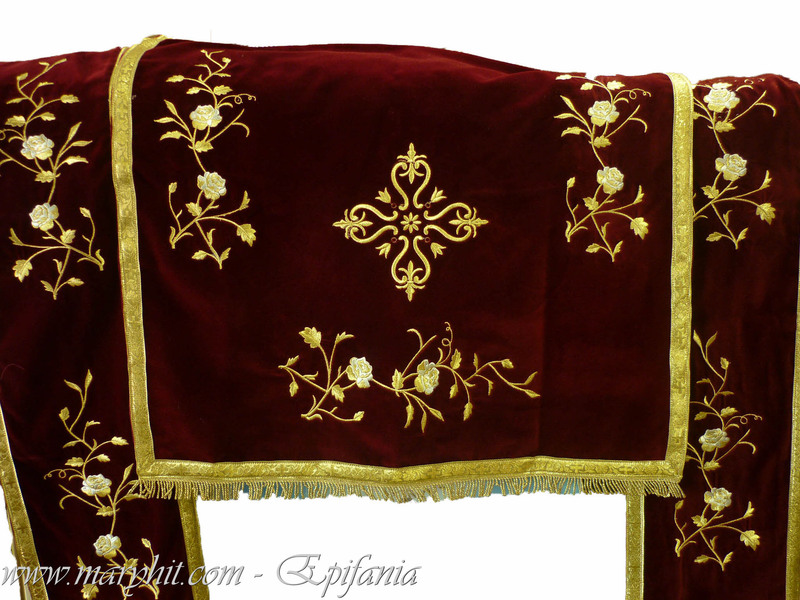 IB011 - Tablecloth and Napkin burgundy velvet embroidered with flowers pattern . 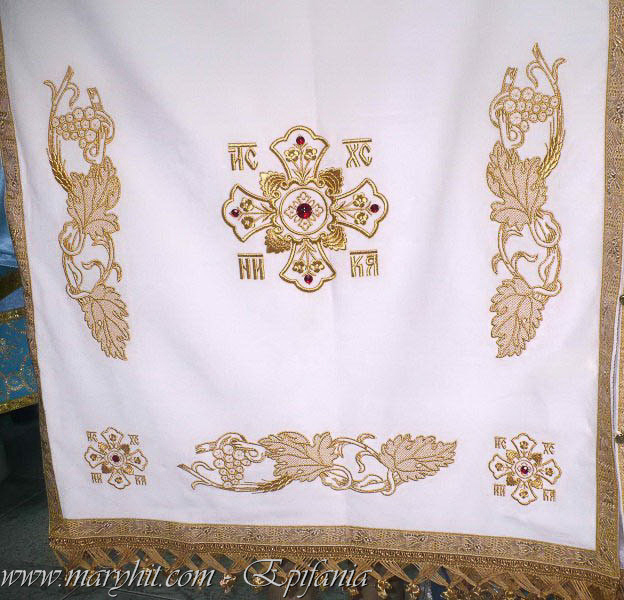 IB012 - Tablecloth of white velvet embroidered crosses. 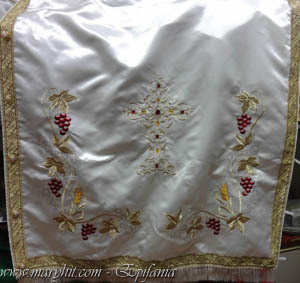 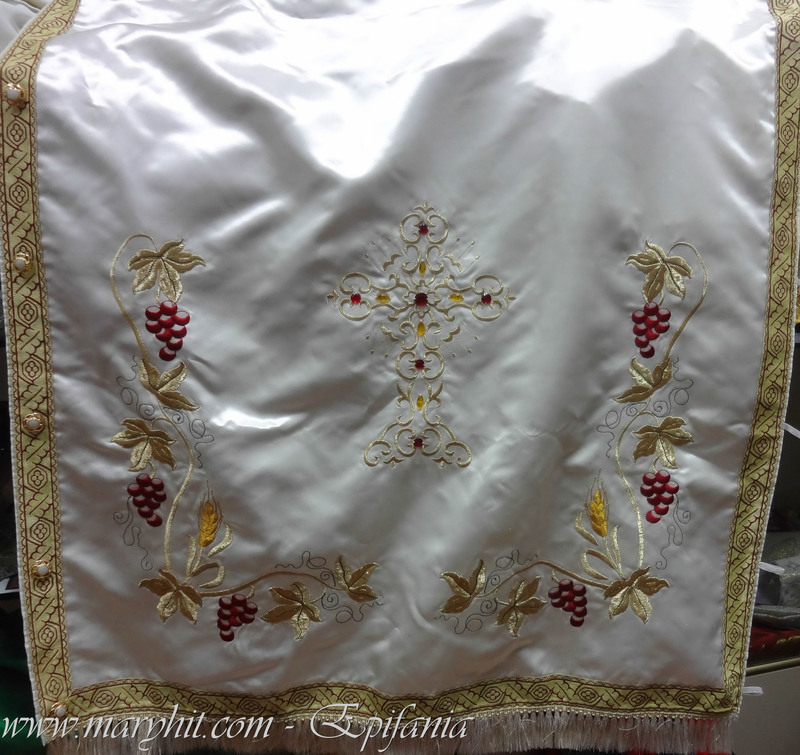 IB013 - Clothing church taffeta embroidery red grapes. IB014 - Model clothing and crosses embroidered brocade Church . IB015 - Clothing church glossy white taffeta embroidered with flowers and grapes pattern . 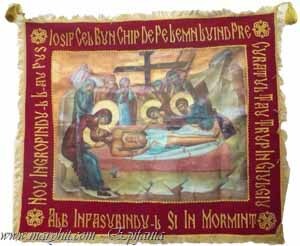 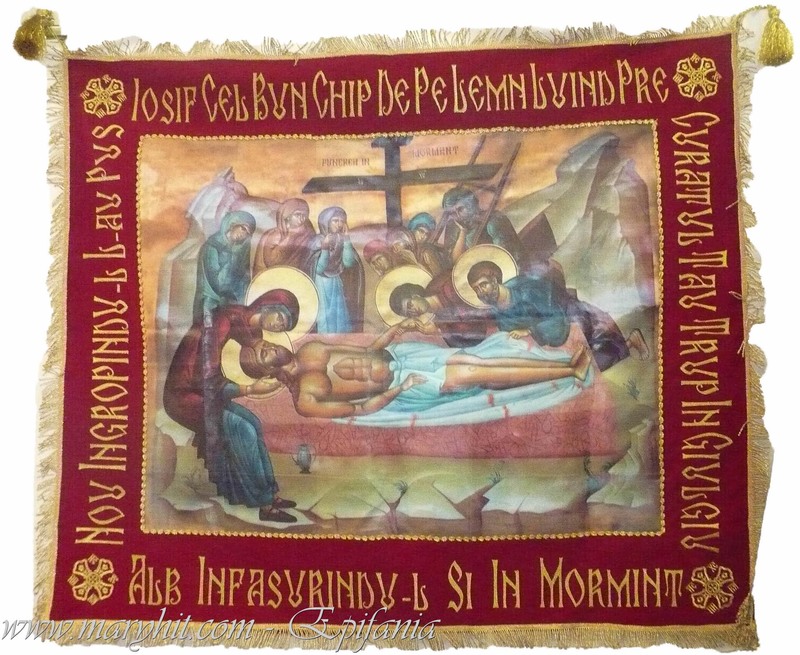 IB016 - garment and pillow coverings printed with St Paraskevi icon . 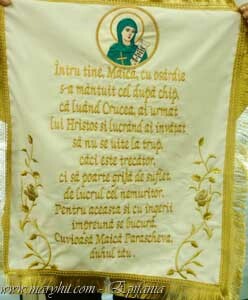 IB017 - Epitaph ( Saint Air ) with Assumption printer icon of the Savior ( weatherproof ) . 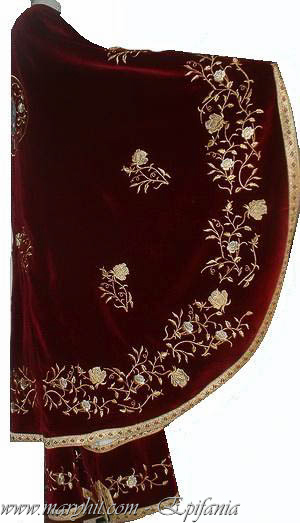 Edge of red velvet embroidered with embroidery writing . 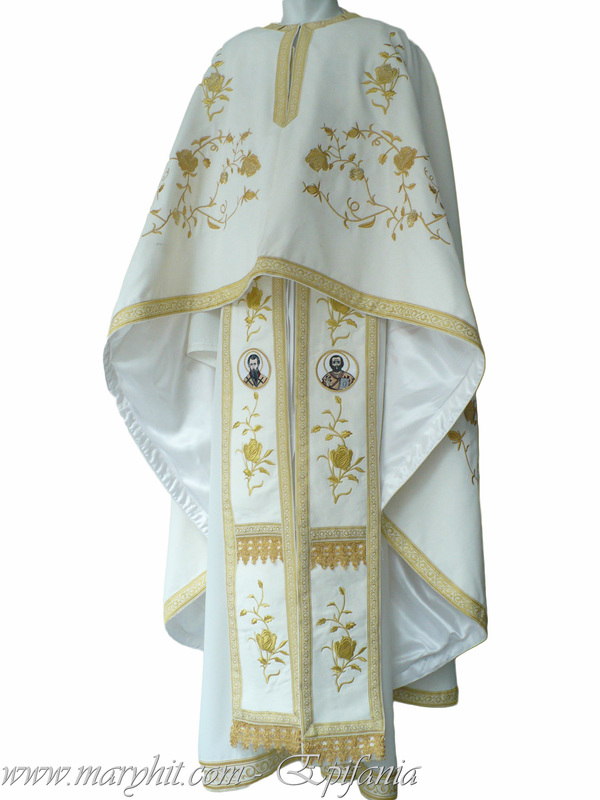 IB018 - Epitaph ( Saint Air ) with Assumption printer icon ( weather resistant ) . 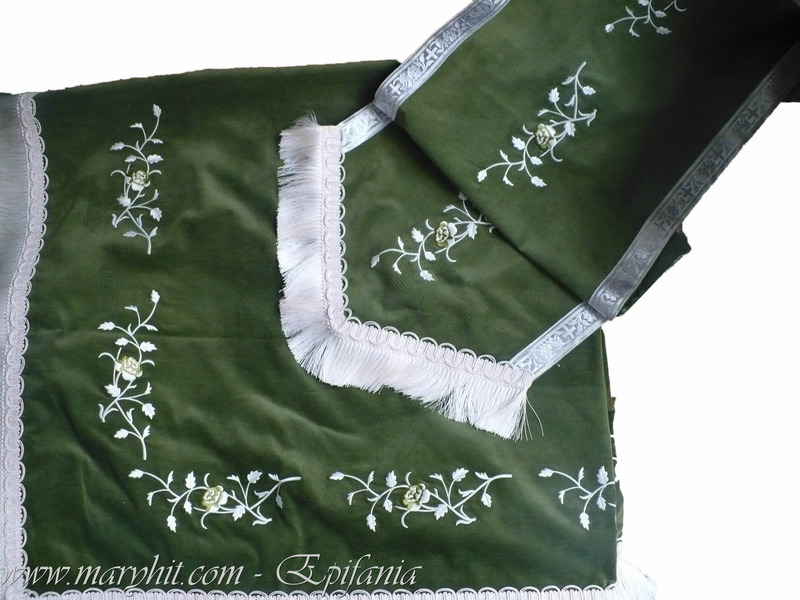 Edge of green velvet with embroidery pattern flowers and grapes . 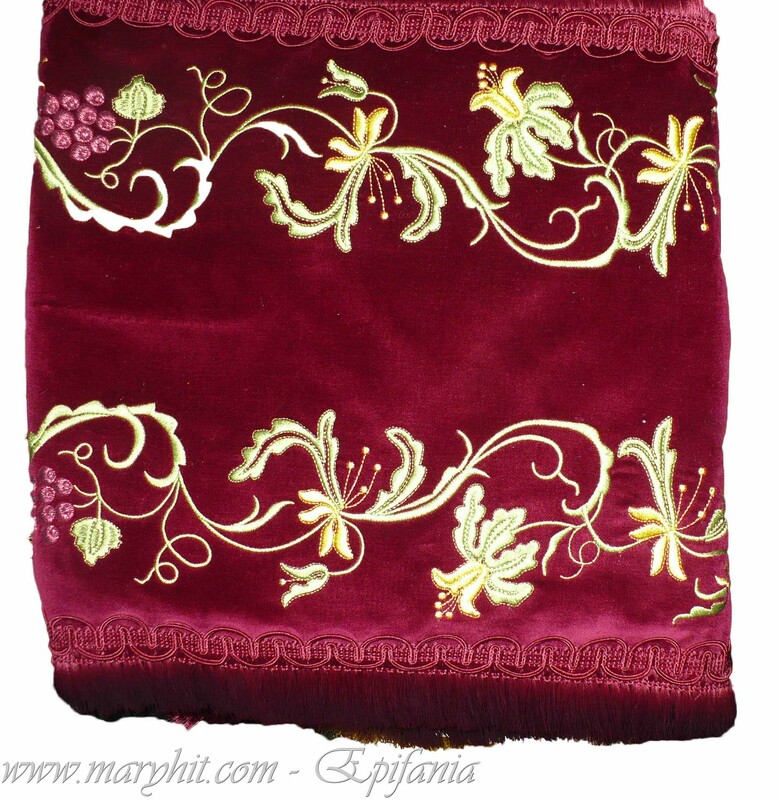 IB019 - Flag ( lobe ) with the icon of the Savior printed ( weatherproof ) burgundy velvet embroidered with flowers and grapes pattern . 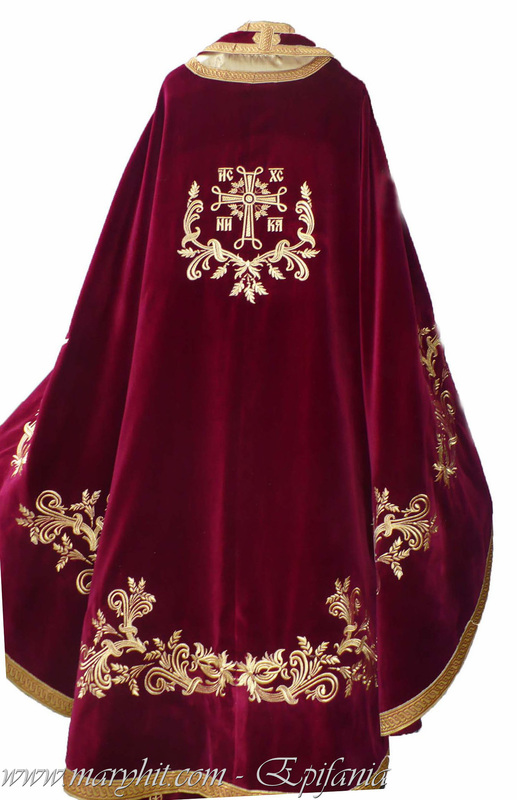 IB020 - Flag ( lobe ) the icon of Virgin Mary imprinted ( weatherproof ) burgundy velvet embroidered with flowers and grapes pattern . 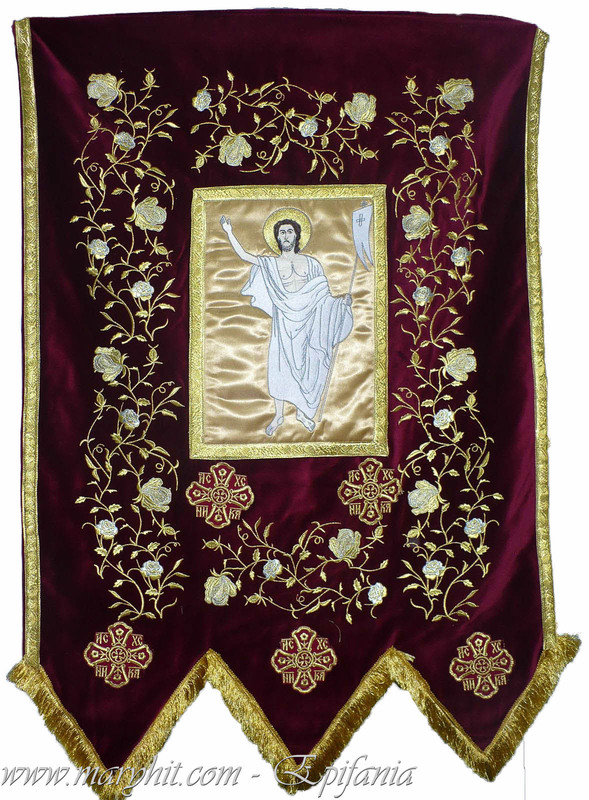 IB021 - Flag ( lobe ) of the Resurrection icon embroidered burgundy velvet with embroidery pattern roses. 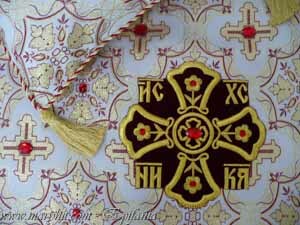 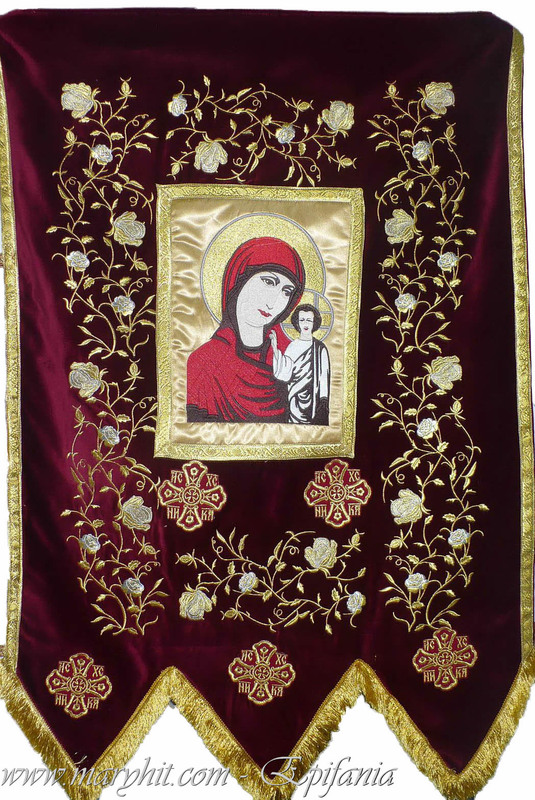 IB022 - Flag ( lobe ) of the Theotokos icon embroidered burgundy velvet with embroidery pattern roses. 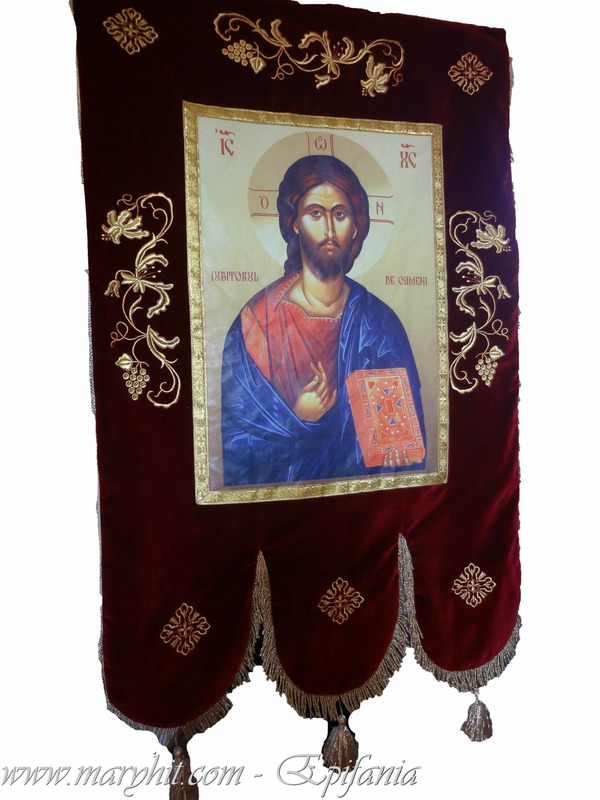 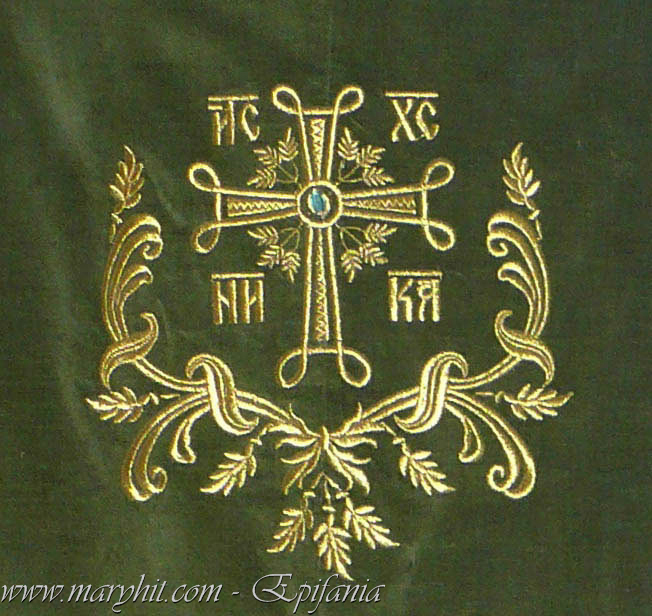 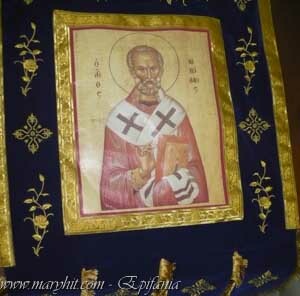 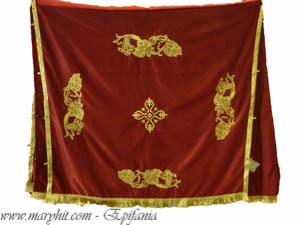 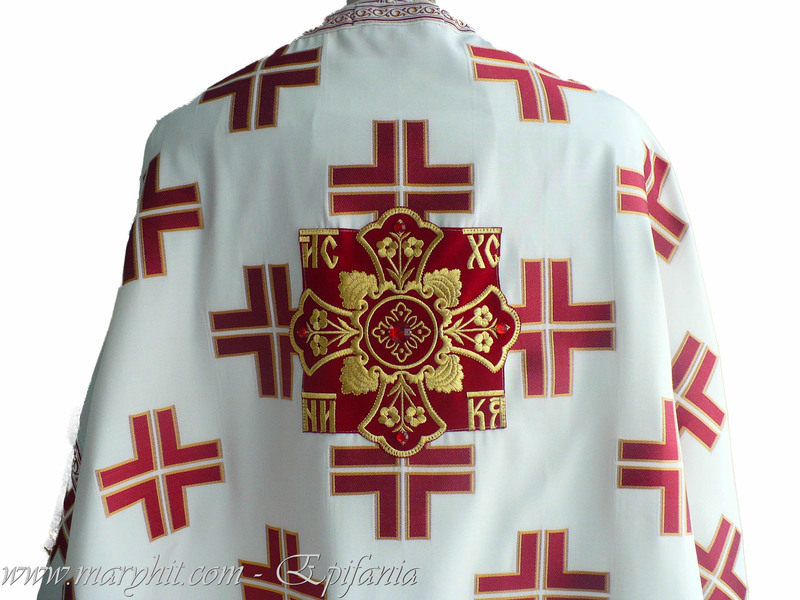 IB023 - Flag ( lobe ) of St. Nicholas icon bleomaren printed and embroidered velvet roses pattern . 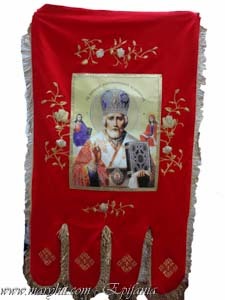 IB024 - Flag ( lobe ) of St. Nicholas icon printed and embroidered red velvet roses pattern . 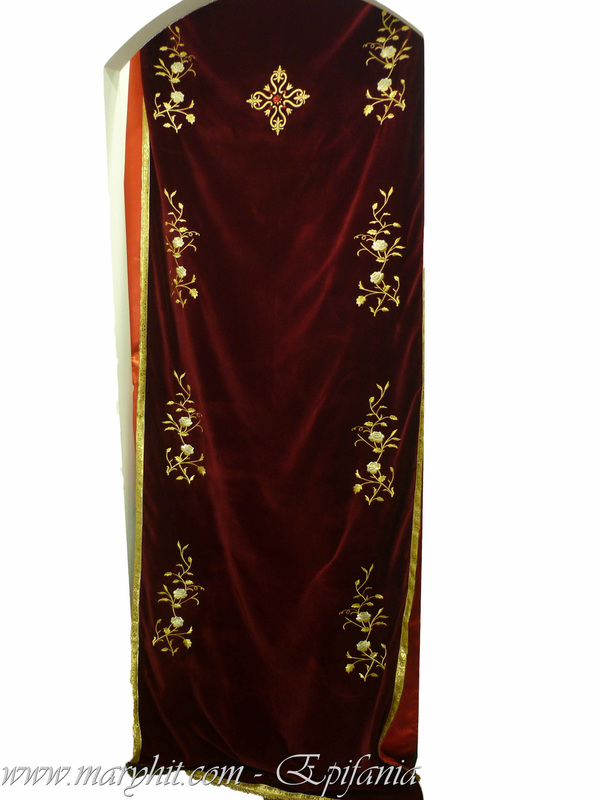 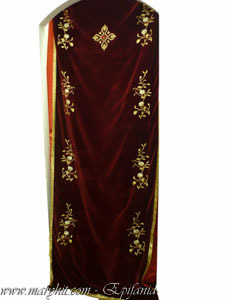 IB025 - dver ( royal door curtain ) burgundy velvet embroidered with roses and crosses pattern . 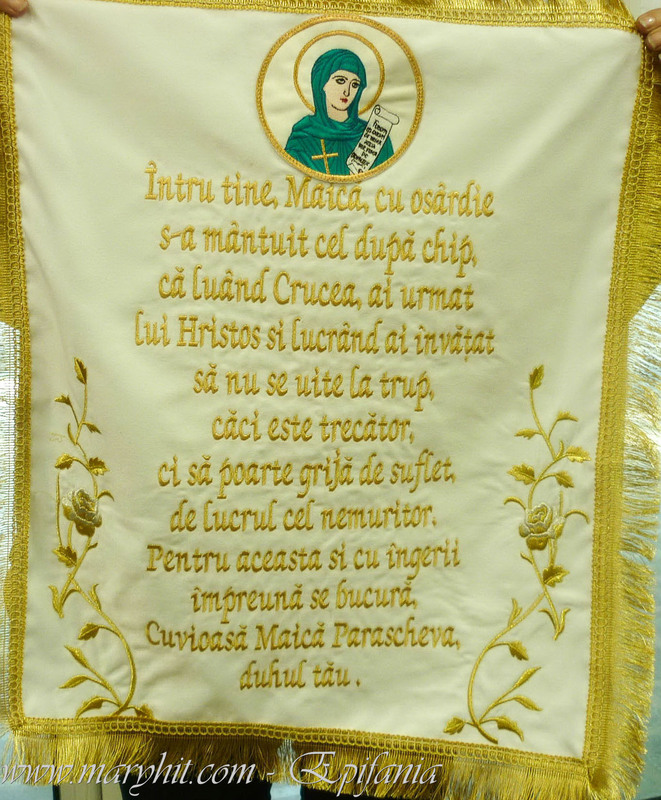 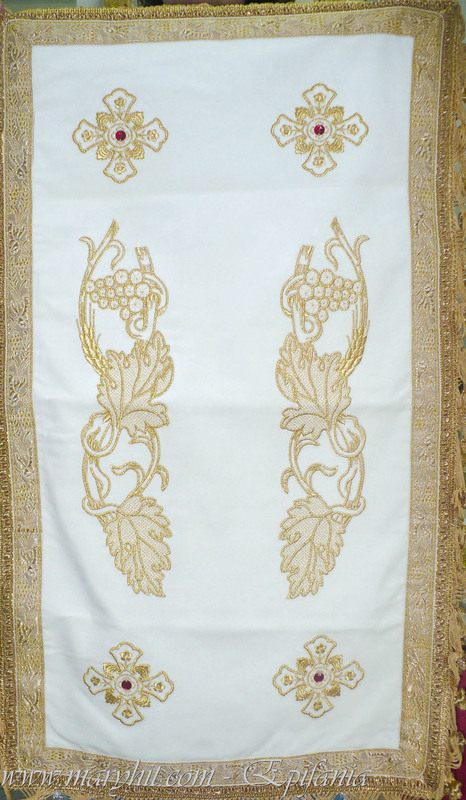 IB026 - dver ( door curtain imperial ) of white brocade upholstery Virgin Acoperamantul icon . IB027 - dver ( door curtain imperial ) of white brocade upholstery Arhangehel icon Michael. 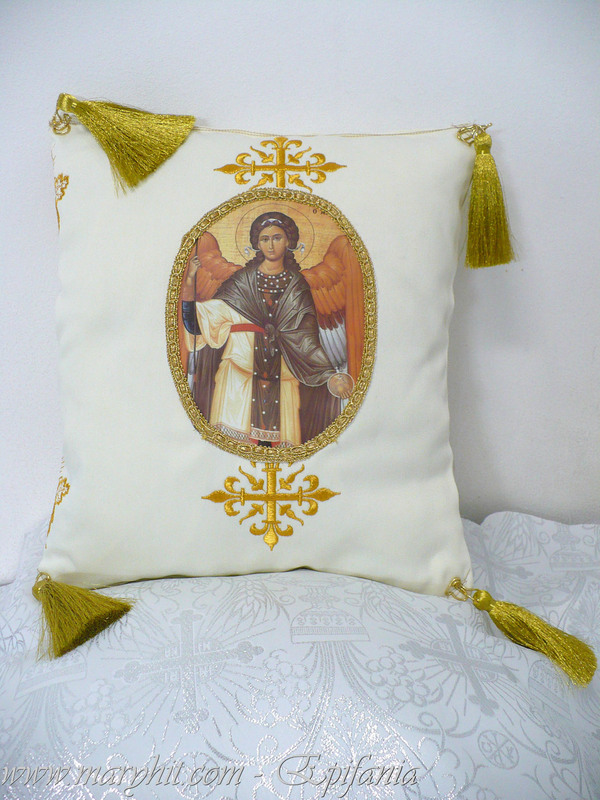 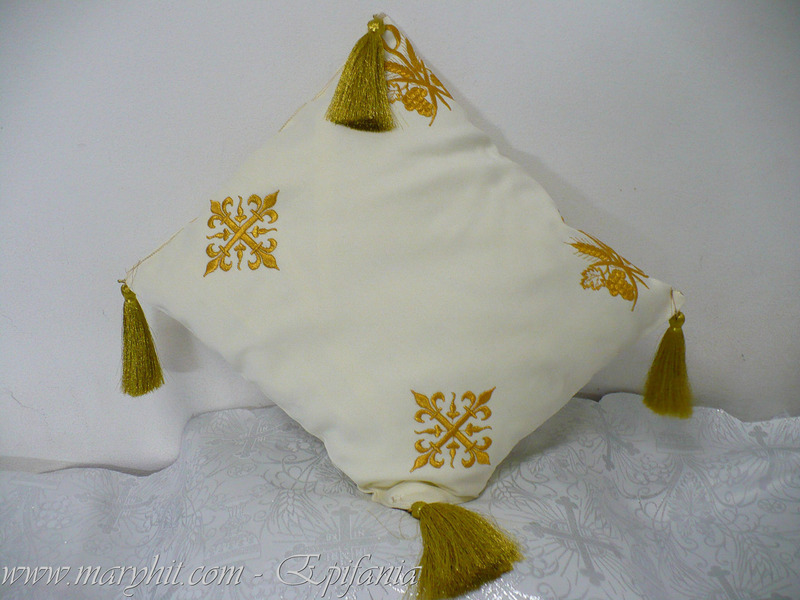 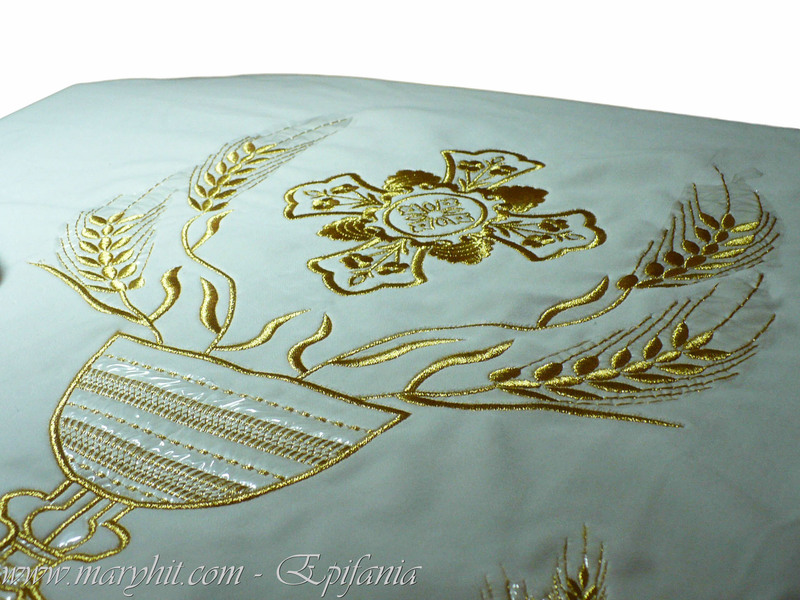 IB028 - Archangel icon pillow embroidered with crosses. 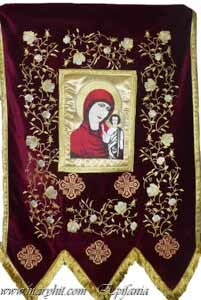 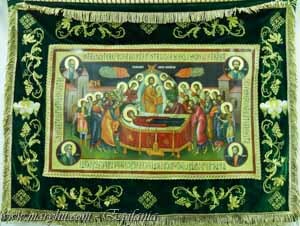 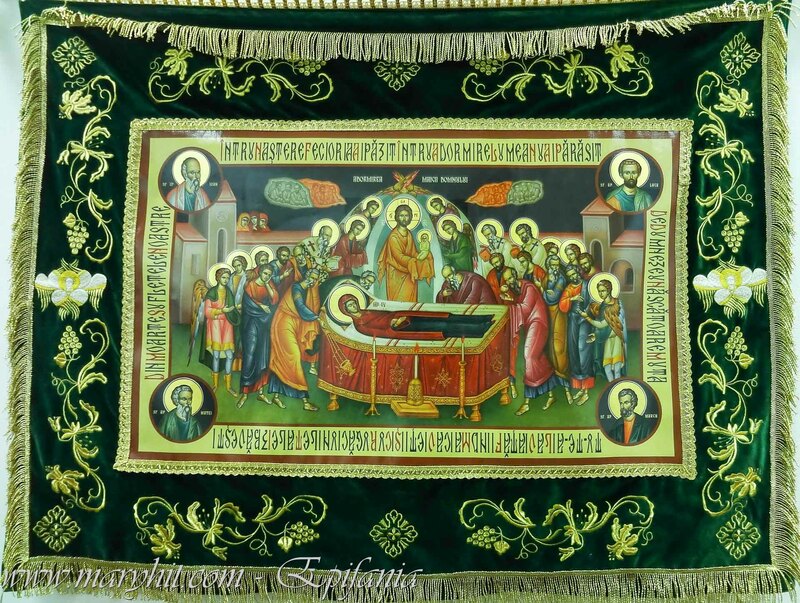 IB029 - Servet of white velvet embroidered icon of Virgin Mary and hymn . 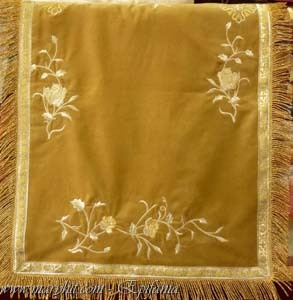 IB030 - Servet velvet yellow with brown thread embroidery pattern roses. IB031 - Servet of blue velvet with silver thread embroidery , pattern roses.